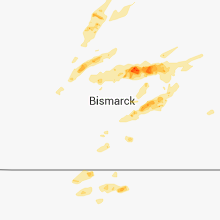 The Beulah, ND area has had 10 reports of on-the-ground hail by trained spotters, and has been under severe weather warnings 36 times during the past 12 months. 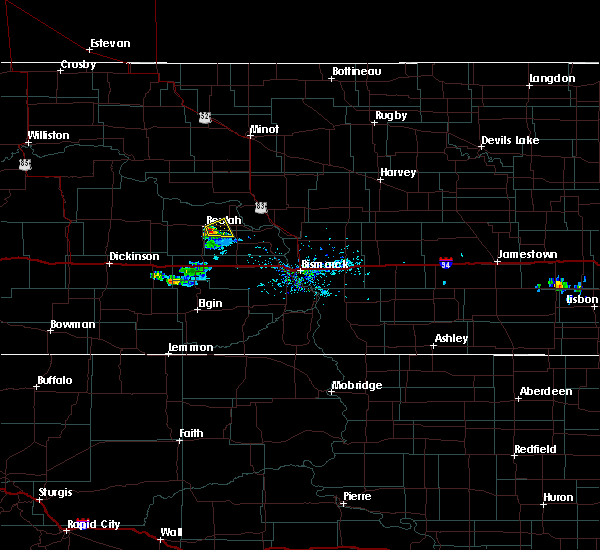 Doppler radar has detected hail at or near Beulah, ND on 43 occasions, including 11 occasions during the past year. 9/12/2018 10:55 PM MDT At 1154 pm cdt, a severe thunderstorm was located near riverdale, or 15 miles south of garrison, moving northeast at 55 mph (radar indicated). Hazards include quarter size hail. Damage to vehicles is expected. 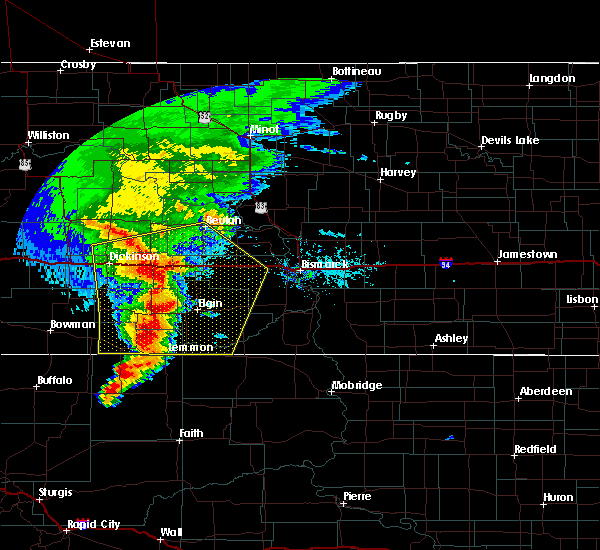 This severe storm will be near, underwood around 1205 am cdt. 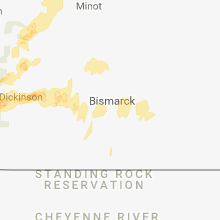 9/12/2018 10:34 PM MDT At 1134 pm cdt, a severe thunderstorm was located near hazen, or 7 miles east of beulah, moving northeast at 45 mph (radar indicated). Hazards include quarter size hail. Damage to vehicles is expected. This severe storm will be near, stanton around 1145 pm cdt. 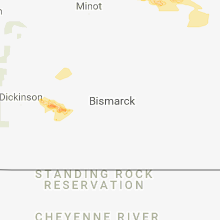 9/12/2018 10:15 PM MDT At 1114 pm cdt, a severe thunderstorm was located 6 miles southwest of beulah, moving northeast at 55 mph (radar indicated). Hazards include quarter size hail. Damage to vehicles is expected. 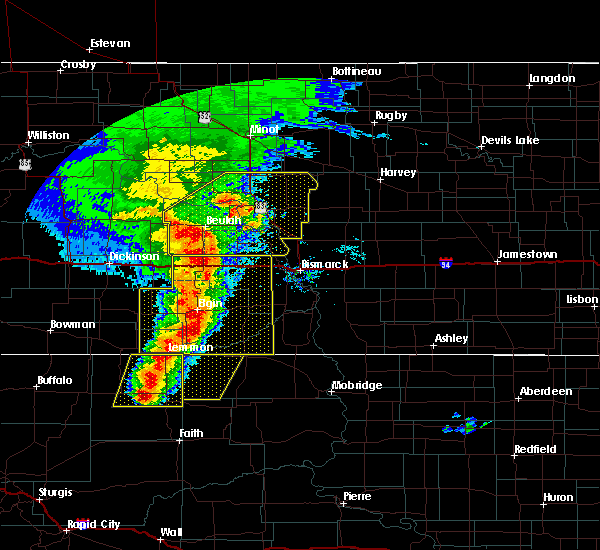 this severe thunderstorm will be near, beulah around 1125 pm cdt. Hazen around 1130 pm cdt. 7/14/2018 2:51 PM MDT At 351 pm cdt/251 pm mdt/, a severe thunderstorm was located near halliday, or 23 miles east of killdeer, moving east at 25 mph (radar indicated). Hazards include quarter size hail. Damage to vehicles is expected. 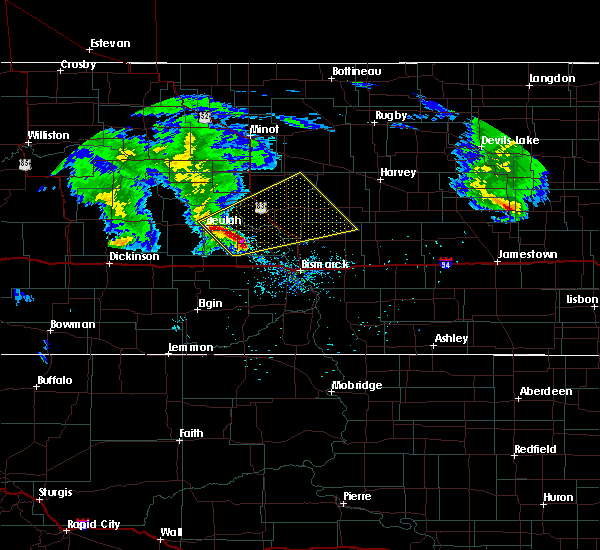 this severe thunderstorm will be near, dodge around 255 pm mdt. beulah bay recreation area around 445 pm cdt. Other locations impacted by this severe thunderstorm include dakota waters recreation area. 7/10/2018 1:56 AM MDT At 255 am cdt, severe thunderstorms were located along a line extending from 6 miles north of coleharbor to near stanton, moving east at 55 mph (trained weather spotters. 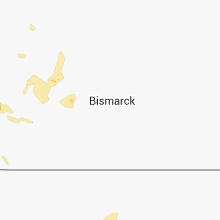 a 60 mph wind gust was recorded at garrison at 243 am cdt). Hazards include 60 mph wind gusts. Expect damage to roofs, siding, and trees. These severe thunderstorms will remain over mainly rural areas of central mclean and northern mercer counties, including the following locations, dakota waters recreation area. 7/10/2018 1:36 AM MDT At 236 am cdt/136 am mdt/, severe thunderstorms were located along a line extending from 7 miles northwest of garrison to 4 miles southwest of hazen bay recreation area to 4 miles north of halliday, moving east at 45 mph (radar indicated). Hazards include 60 mph wind gusts and penny size hail. Expect damage to roofs, siding, and trees. these severe storms will be near, hazen bay recreation area and beulah bay recreation area around 240 am cdt. garrison around 245 am cdt. 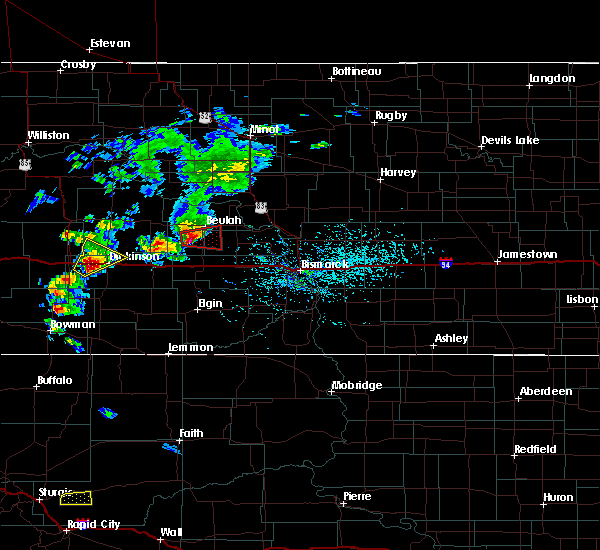 pick city and lake sakakawea state park around 250 am cdt. 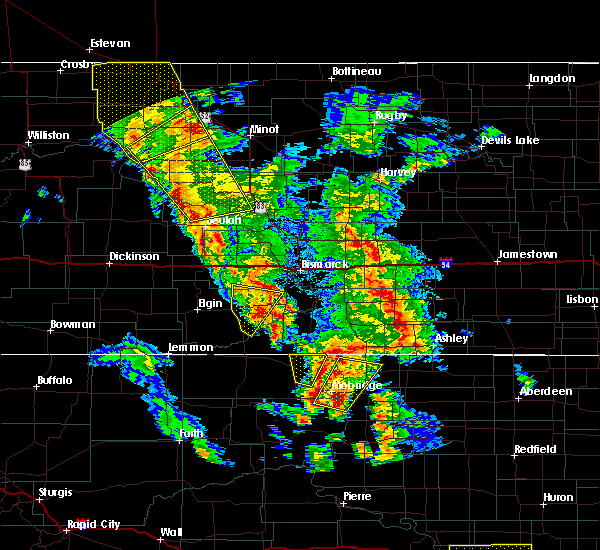 golden valley around 255 am cdt. zap around 305 am cdt. 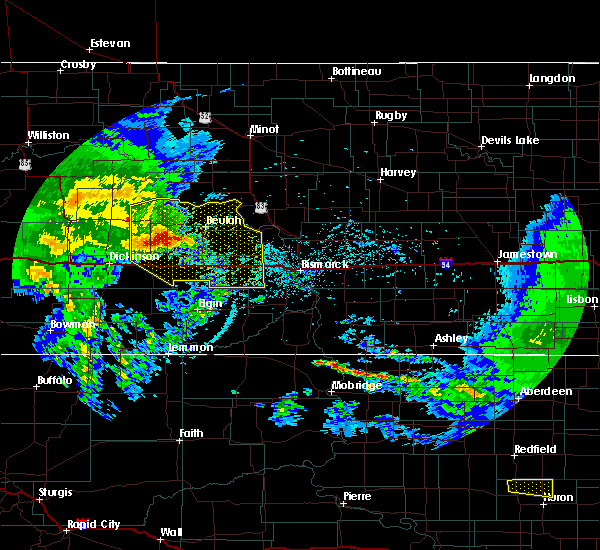 beulah and hazen around 315 am cdt. Other locations impacted by these severe thunderstorms include dakota waters recreation area, emmet, white shield and twin buttes. 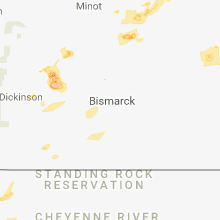 7/10/2018 1:18 AM MDT At 217 am cdt/117 am mdt/, a severe thunderstorm was located 6 miles south of indian hills recreation area, or 24 miles northwest of beulah, moving east at 45 mph (radar indicated). Hazards include 60 mph wind gusts and penny size hail. Expect damage to roofs, siding, and trees. this severe thunderstorm will be near, beulah bay recreation area around 240 am cdt. hazen bay recreation area around 250 am cdt. 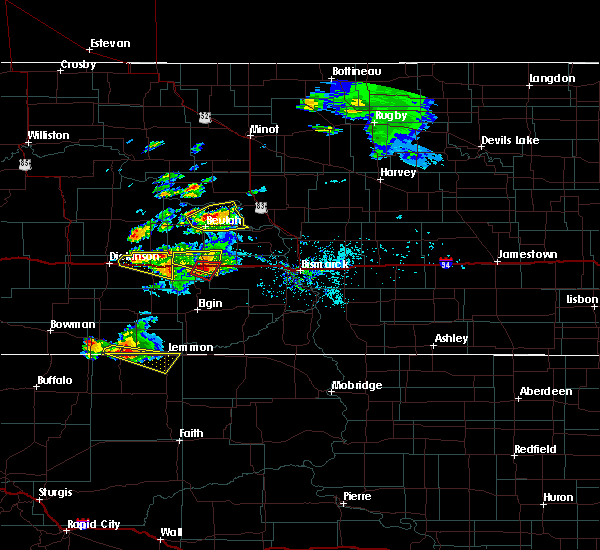 hazen around 255 am cdt. Other locations impacted by this severe thunderstorm include dakota waters recreation area, emmet, white shield and twin buttes. 6/29/2018 12:31 AM CDT At 1231 am cdt, severe thunderstorms were located along a line extending from 10 miles southeast of benedict to underwood to 10 miles south of center, moving east at 55 mph. these are very dangerous storms (radar indicated). Hazards include 80 mph wind gusts and quarter size hail. Flying debris will be dangerous to those caught without shelter. mobile homes will be heavily damaged. expect considerable damage to roofs, windows, and vehicles. extensive tree damage and power outages are likely. 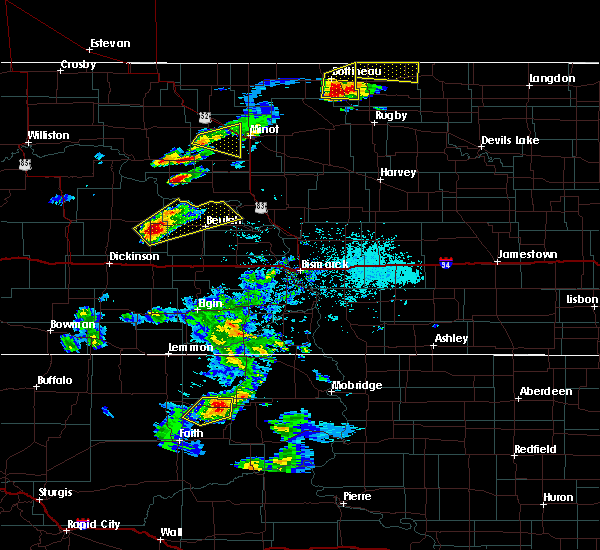 these severe storms will be near, butte around 1240 am cdt. turtle lake and mercer around 1245 am cdt. Other locations impacted by these severe thunderstorms include white shield, strawberry lake, price, falkirk, sanger, ruso, hensler, dakota waters recreation area, emmet and fort clark. 6/29/2018 12:06 AM CDT A severe thunderstorm warning remains in effect until 1245 am cdt for mclean. oliver and mercer counties. At 1206 am cdt, severe thunderstorms were located along a line extending from 4 miles south of max to 4 miles southeast of hazen bay recreation area to 12 miles northeast of glen ullin, moving east at 45 mph. 6/28/2018 10:40 PM MDT The severe thunderstorm warning for dunn, northwestern mclean, northeastern billings, east central mckenzie, south central mountrail and mercer counties will expire at 1145 pm cdt/1045 pm mdt/, the storms which prompted the warning have moved out of the area. therefore, the warning will be allowed to expire. however small hail and gusty winds are still possible with these thunderstorms. a severe thunderstorm watch remains in effect until 800 am cdt/700 am mdt/ for south central, southwestern, north central and northwestern north dakota. remember, a severe thunderstorm warning still remains in effect for eastern dunn, mclean, and mercer counties. 6/28/2018 11:38 PM CDT At 1138 pm cdt/1038 pm mdt/, severe thunderstorms were located along a line extending from 4 miles east of garrison to 8 miles southeast of indian hills recreation area to 8 miles north of richardton, moving east at 40 mph. these are very dangerous storms (radar indicated). Hazards include 80 mph wind gusts and half dollar size hail. Flying debris will be dangerous to those caught without shelter. mobile homes will be heavily damaged. expect considerable damage to roofs, windows, and vehicles. extensive tree damage and power outages are likely. severe thunderstorms will be near, beulah bay recreation area around 1155 pm cdt. hazen bay recreation area around 1200 am cdt. 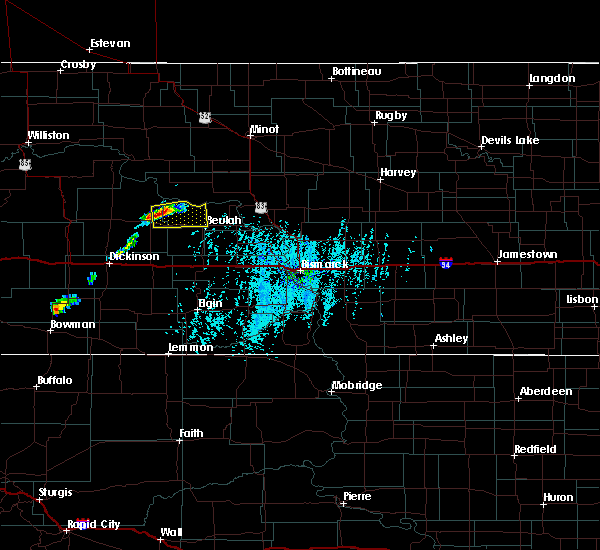 pick city, lake sakakawea state park and fort stevenson state park around 1215 am cdt. riverdale around 1220 am cdt. coleharbor around 1230 am cdt. 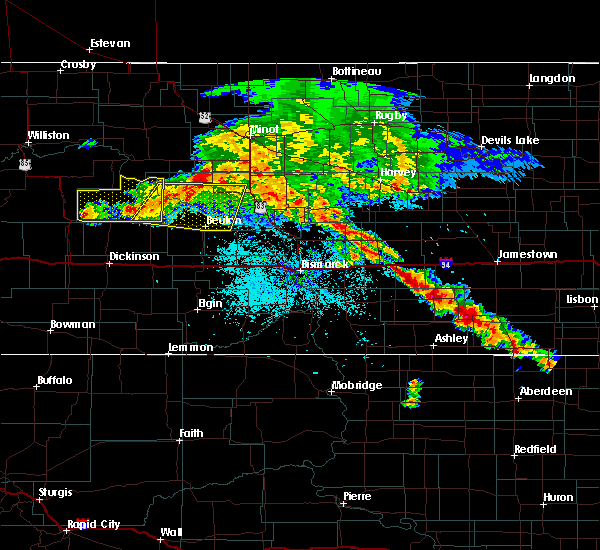 underwood around 1235 am cdt. turtle lake around 1245 am cdt. Other locations impacted by these severe thunderstorms include white shield, strawberry lake, price, twin buttes, falkirk, sanger, ruso, hensler, dakota waters recreation area and emmet. 6/28/2018 10:09 PM MDT At 1046 pm cdt/946 pm mdt/, severe thunderstorms were located along a line extending from 6 miles south of van hook park to 4 miles northwest of halliday to 10 miles northwest of dickinson, moving east at 50 mph (radar indicated). Hazards include 70 mph wind gusts and quarter size hail. Hail damage to vehicles is expected. expect considerable tree damage. wind damage is also likely to mobile homes, roofs, and outbuildings. 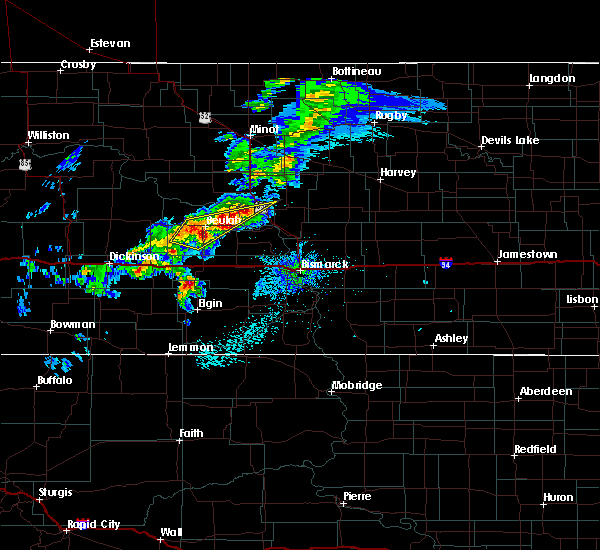 severe thunderstorms will be near, halliday around 950 pm mdt. 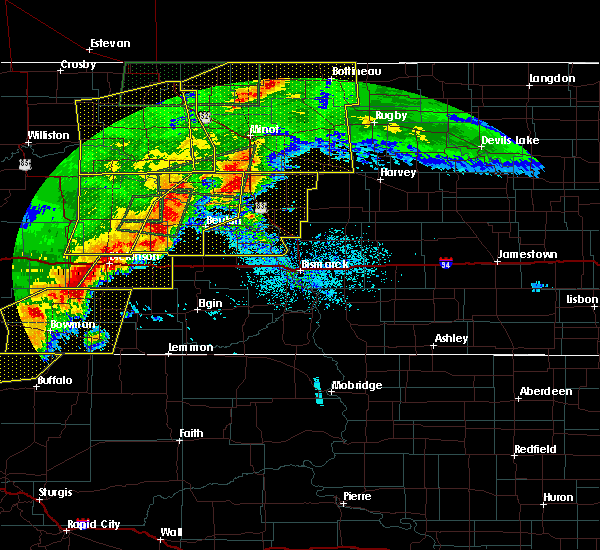 dodge around 1000 pm mdt. golden valley around 1005 pm mdt. zap around 1115 pm cdt. roseglen around 1120 pm cdt. beulah and beulah bay recreation area around 1125 pm cdt. hazen and hazen bay recreation area around 1130 pm cdt. other locations impacted by these severe thunderstorms include skunk creek bay recreation area, white shield, twin buttes, pouch point recreation area, hirschville, deep water creek recreation area, dakota waters recreation area, oakdale, raub and emmet. A tornado watch remains in effect until 1100 pm cdt/1000 pm mdt/ for south central, southwestern, north central and northwestern north dakota. 6/28/2018 9:46 PM MDT At 1046 pm cdt/946 pm mdt/, severe thunderstorms were located along a line extending from 6 miles south of van hook park to 4 miles northwest of halliday to 10 miles northwest of dickinson, moving east at 50 mph (radar indicated). Hazards include 70 mph wind gusts and quarter size hail. Hail damage to vehicles is expected. expect considerable tree damage. wind damage is also likely to mobile homes, roofs, and outbuildings. 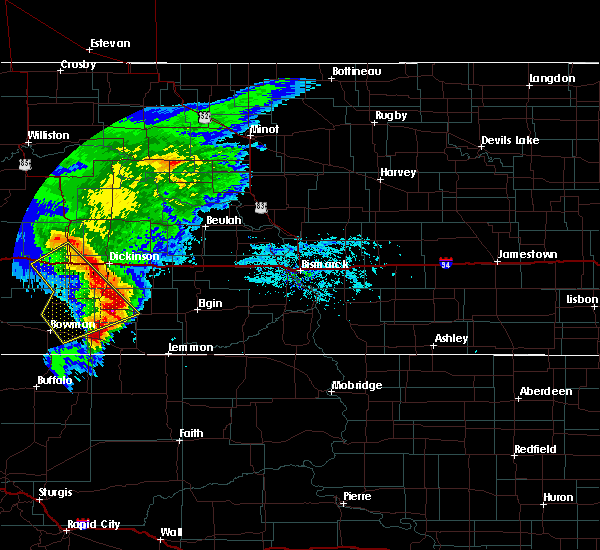 severe thunderstorms will be near, halliday around 950 pm mdt. 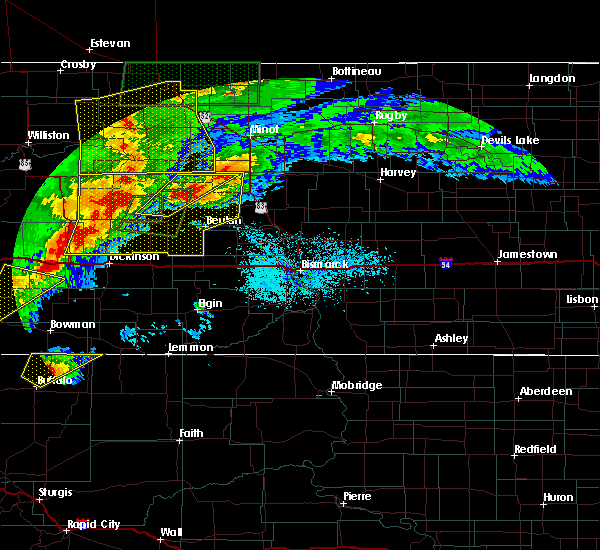 dodge around 1000 pm mdt. golden valley around 1005 pm mdt. zap around 1115 pm cdt. roseglen around 1120 pm cdt. beulah and beulah bay recreation area around 1125 pm cdt. hazen and hazen bay recreation area around 1130 pm cdt. other locations impacted by these severe thunderstorms include skunk creek bay recreation area, white shield, twin buttes, pouch point recreation area, hirschville, deep water creek recreation area, dakota waters recreation area, oakdale, raub and emmet. A tornado watch remains in effect until 1100 pm cdt/1000 pm mdt/ for south central, southwestern, north central and northwestern north dakota. 6/26/2018 8:55 PM MDT At 955 pm cdt, a severe thunderstorm was located near zap, or 7 miles northwest of beulah, moving northeast at 30 mph (radar indicated). Hazards include quarter size hail. Damage to vehicles is expected. this severe thunderstorm will be near, beulah bay recreation area around 1020 pm cdt. hazen bay recreation area around 1030 pm cdt. 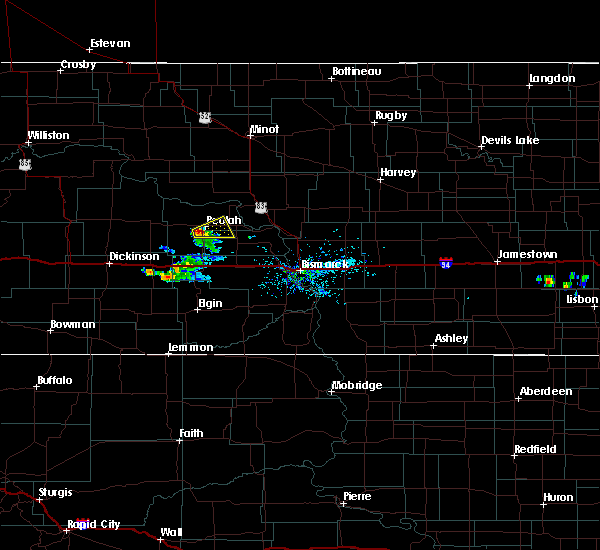 pick city and lake sakakawea state park around 1045 pm cdt. Other locations impacted by this severe thunderstorm include dakota waters recreation area. 6/26/2018 7:58 PM MDT At 858 pm cdt, a severe thunderstorm was located 7 miles north of beulah, moving northeast at 35 mph (radar indicated). Hazards include 60 mph wind gusts and quarter size hail. Hail damage to vehicles is expected. expect wind damage to roofs, siding, and trees. 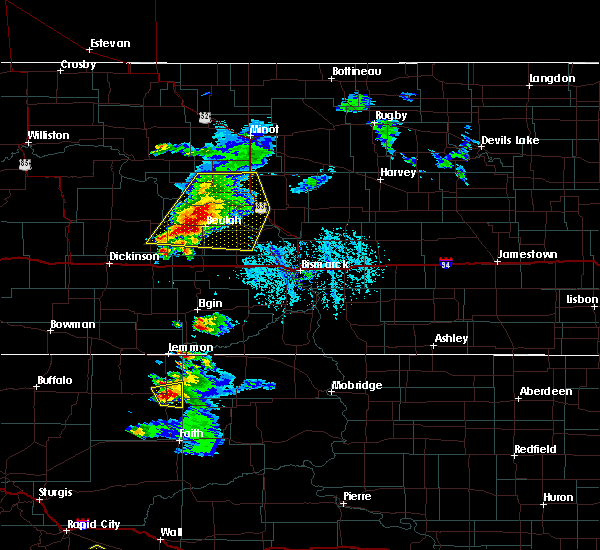 this severe storm will be near, hazen around 905 pm cdt. hazen bay recreation area around 915 pm cdt. Pick city and lake sakakawea state park around 930 pm cdt. 6/26/2018 7:44 PM MDT At 844 pm cdt, a severe thunderstorm was located over zap, or 7 miles west of beulah, moving northeast at 30 mph (radar indicated). Hazards include 60 mph wind gusts and quarter size hail. Hail damage to vehicles is expected. expect wind damage to roofs, siding, and trees. 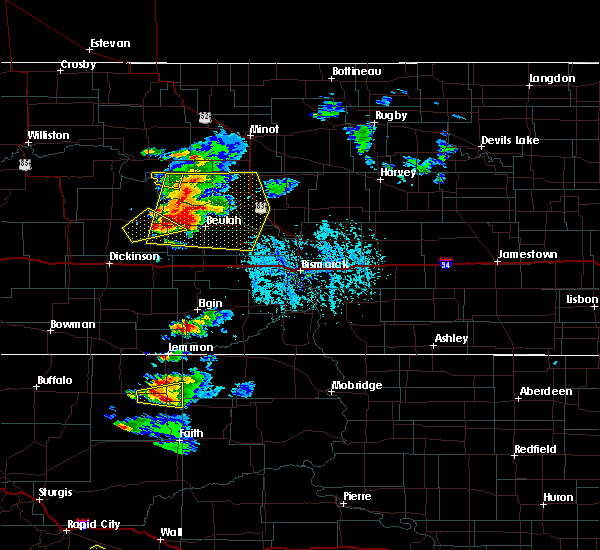 this severe thunderstorm will be near, beulah around 855 pm cdt. 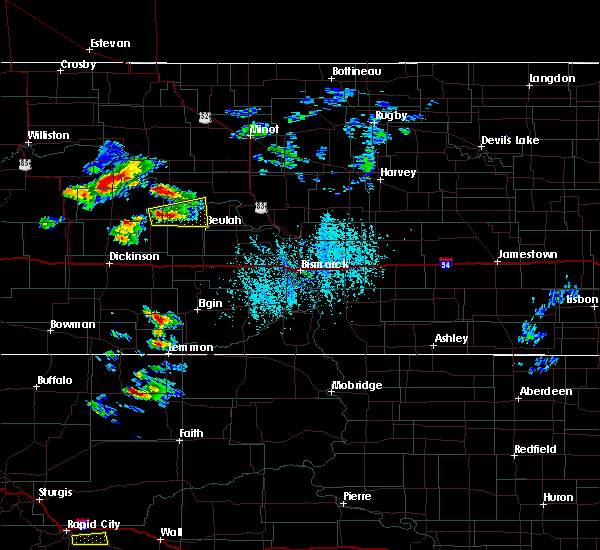 hazen around 910 pm cdt. hazen bay recreation area around 920 pm cdt. 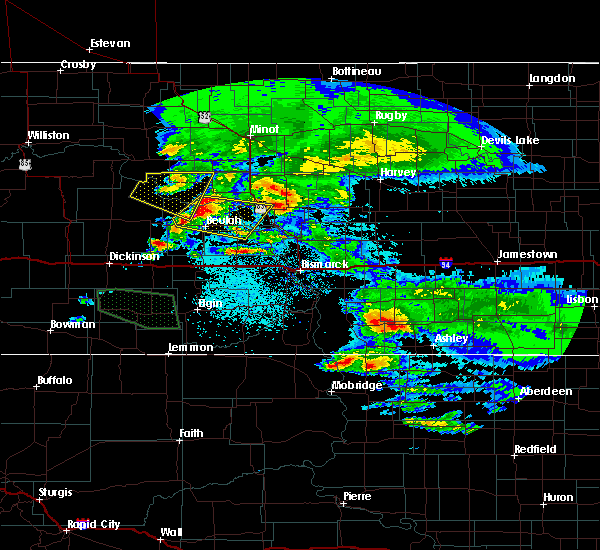 pick city and lake sakakawea state park around 935 pm cdt. Other locations impacted by this severe thunderstorm include dakota waters recreation area. 6/14/2018 8:05 PM MDT At 904 pm cdt, a severe thunderstorm was located 6 miles west of beulah bay recreation area, or 15 miles north of beulah, moving northeast at 35 mph (radar indicated). Hazards include 60 mph wind gusts and half dollar size hail. Hail damage to vehicles is expected. expect wind damage to roofs, siding, and trees. this severe storm will be near, beulah bay recreation area around 915 pm cdt. hazen bay recreation area around 925 pm cdt. other locations impacted by this severe thunderstorm include dakota waters recreation area. 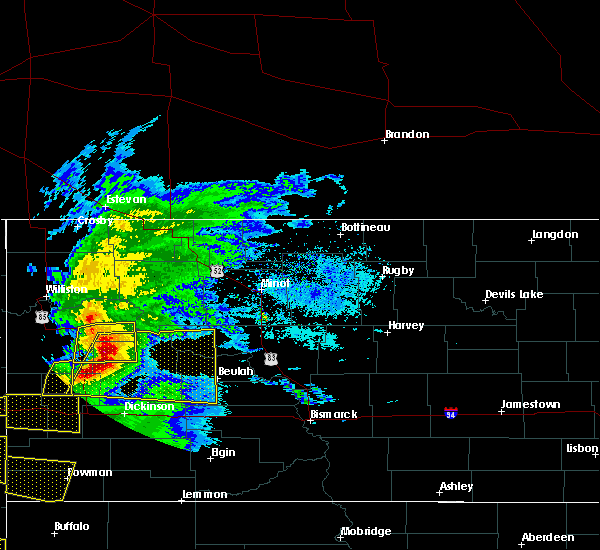 A tornado watch remains in effect until 1100 pm cdt for south central north dakota. 6/14/2018 7:46 PM MDT At 844 pm cdt/744 pm mdt/, a severe thunderstorm was located near golden valley, or 16 miles northwest of beulah, moving northeast at 35 mph. this storm has a history of producing quarter size hail, reported by trained spotters (trained weather spotters). Hazards include 60 mph wind gusts and quarter size hail. Hail damage to vehicles is expected. expect wind damage to roofs, siding, and trees. this severe storm will be near, beulah bay recreation area around 915 pm cdt. hazen bay recreation area around 925 pm cdt. other locations impacted by this severe thunderstorm include dakota waters recreation area. A tornado watch remains in effect until 1100 pm cdt/1000 pm mdt/ for south central and southwestern north dakota. 6/14/2018 7:27 PM MDT At 824 pm cdt/724 pm mdt/, a severe thunderstorm was located 5 miles southwest of dodge, or 23 miles east of killdeer, moving northeast at 35 mph. 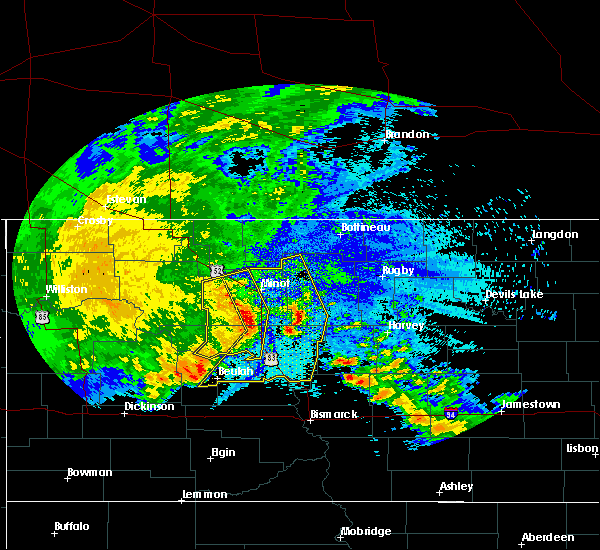 this storm was moving towards lake sakakawea (radar indicated). Hazards include 60 mph wind gusts and quarter size hail. Hail damage to vehicles is expected. expect wind damage to roofs, siding, and trees. 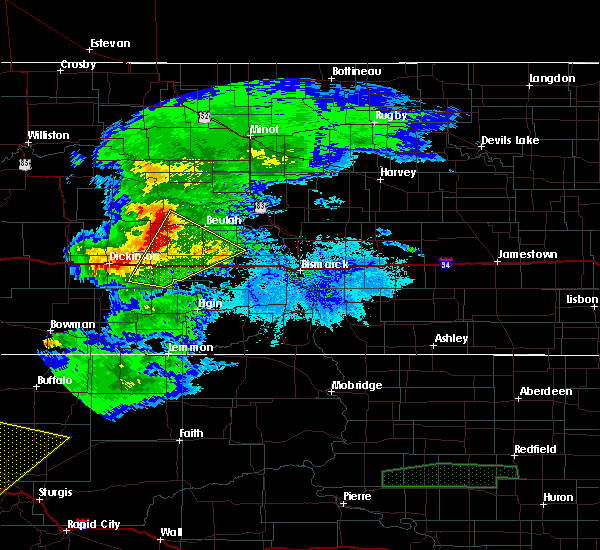 this severe thunderstorm will be near, dodge around 735 pm mdt. golden valley around 840 pm cdt. beulah bay recreation area around 915 pm cdt. hazen bay recreation area around 925 pm cdt. other locations impacted by this severe thunderstorm include dakota waters recreation area. 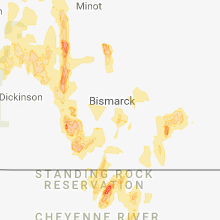 if you are on lake sakakawea, between indians hills recreation area and lake sakakawea state park, get to land and move indoors. A tornado watch remains in effect until 1100 pm cdt/1000 pm mdt/ for south central and southwestern north dakota. 6/1/2018 6:30 PM MDT At 730 pm cdt, severe thunderstorms were located along a line extending from near hazen bay recreation area to near hannover, moving northeast at 35 mph (radar indicated). Hazards include 60 mph wind gusts and quarter size hail. Hail damage to vehicles is expected. expect wind damage to roofs, siding, and trees. locations impacted include, beulah, hazen, center, stanton, hannover and fort clark. 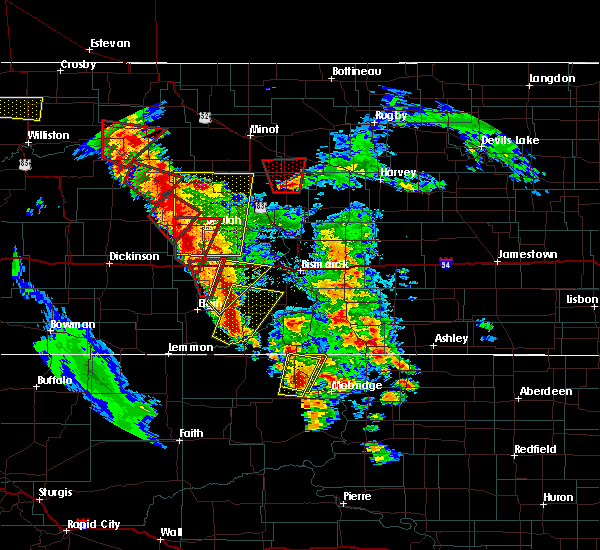 A tornado watch remains in effect until 1100 pm cdt for south central north dakota. 6/1/2018 7:11 PM CDT At 709 pm cdt, severe thunderstorms were located along a line extending from 5 miles south of beulah bay recreation area to near new salem, moving northeast at 20 mph (radar indicated). Hazards include 60 mph wind gusts and quarter size hail. Hail damage to vehicles is expected. Expect wind damage to roofs, siding, and trees. 6/1/2018 5:54 PM MDT The tornado warning for south central mercer county will expire at 700 pm cdt, the storm which prompted the warning has weakened below severe limits, and no longer appears capable of producing a tornado. therefore, the warning will be allowed to expire. however gusty winds are still possible with this thunderstorm. 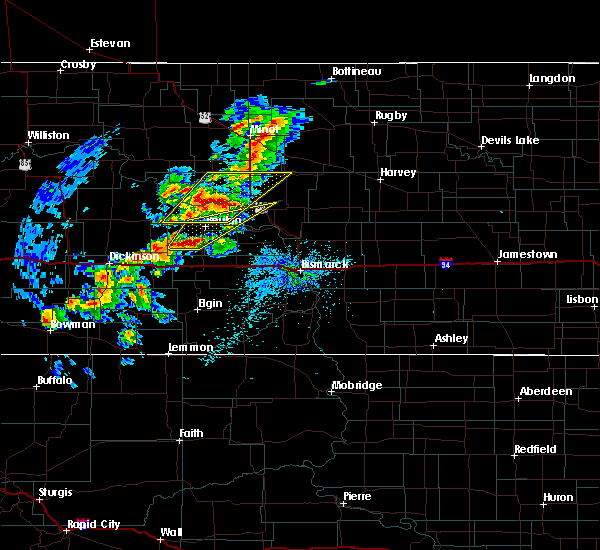 a tornado watch remains in effect until 1100 pm cdt for south central north dakota. 6/1/2018 5:45 PM MDT At 645 pm cdt, a confirmed tornado was located 9 miles south of zap, or 10 miles southwest of beulah, moving north at 30 mph (weather spotters confirmed tornado). Hazards include damaging tornado and quarter size hail. Flying debris will be dangerous to those caught without shelter. mobile homes will be damaged or destroyed. damage to roofs, windows, and vehicles will occur. tree damage is likely. Locations impacted include, beulah and zap. 6/1/2018 5:30 PM MDT At 630 pm cdt, a confirmed tornado was located 9 miles northeast of hebron, or 16 miles northwest of glen ullin, moving north at 25 mph (weather spotters confirmed tornado). Hazards include damaging tornado and quarter size hail. Flying debris will be dangerous to those caught without shelter. mobile homes will be damaged or destroyed. damage to roofs, windows, and vehicles will occur. tree damage is likely. The tornado will be near, zap around 700 pm cdt. 6/1/2018 5:10 PM MDT At 610 pm cdt, a severe thunderstorm capable of producing a tornado was located 10 miles south of zap, or 11 miles southwest of beulah, moving north at 55 mph (radar indicated rotation). Hazards include tornado and ping pong ball size hail. Flying debris will be dangerous to those caught without shelter. mobile homes will be damaged or destroyed. damage to roofs, windows, and vehicles will occur. tree damage is likely. Locations impacted include, beulah, glen ullin, hazen, zap and golden valley. 6/1/2018 5:09 PM MDT At 608 pm cdt, a severe thunderstorm was located 5 miles southwest of beulah bay recreation area, or 11 miles north of beulah, moving north at 60 mph (radar indicated). Hazards include ping pong ball size hail and 60 mph wind gusts. People and animals outdoors will be injured. expect hail damage to roofs, siding, windows, and vehicles. expect wind damage to roofs, siding, and trees. 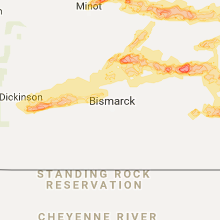 locations impacted include, beulah, garrison, hazen, stanton, max, zap, riverdale, golden valley, pick city, roseglen, hannover, beulah bay recreation area, fort stevenson state park, hazen bay recreation area, lake sakakawea state park, emmet, white shield, dakota waters recreation area and raub. A tornado watch remains in effect until 1100 pm cdt for south central, north central and northwestern north dakota. 6/1/2018 4:54 PM MDT At 553 pm cdt, a severe thunderstorm capable of producing a tornado was located near hebron, or 8 miles northwest of glen ullin, moving north at 55 mph (radar indicated rotation). Hazards include tornado and ping pong ball size hail. Flying debris will be dangerous to those caught without shelter. mobile homes will be damaged or destroyed. damage to roofs, windows, and vehicles will occur. tree damage is likely. This dangerous storm will be near, beulah and zap around 625 pm cdt. 6/1/2018 4:48 PM MDT At 548 pm cdt, a severe thunderstorm was located 10 miles south of beulah, moving north at 60 mph (radar indicated). Hazards include ping pong ball size hail and 60 mph wind gusts. People and animals outdoors will be injured. expect hail damage to roofs, siding, windows, and vehicles. Expect wind damage to roofs, siding, and trees. 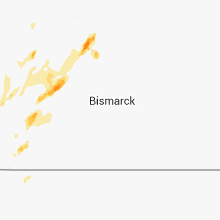 6/1/2018 4:48 PM MDT The national weather service in bismarck has issued a * severe thunderstorm warning for. 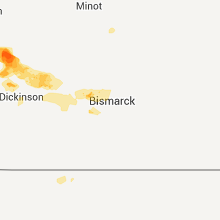 western mclean county in south central north dakota. western oliver county in south central north dakota. 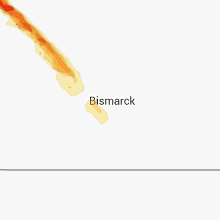 mercer county in south central north dakota. Until 645 pm cdt. 5/31/2018 4:43 PM CDT At 443 pm cdt, a severe thunderstorm was located 7 miles south of beulah, moving northeast at 20 mph (radar indicated). Hazards include 60 mph wind gusts and quarter size hail. Hail damage to vehicles is expected. expect wind damage to roofs, siding, and trees. Locations impacted include, beulah and hazen. 5/31/2018 3:17 PM MDT At 417 pm cdt, a severe thunderstorm was located 13 miles northeast of hebron, or 14 miles southwest of beulah, moving northeast at 20 mph (radar indicated). Hazards include 60 mph wind gusts and quarter size hail. Hail damage to vehicles is expected. Expect wind damage to roofs, siding, and trees. 5/31/2018 2:47 PM MDT At 346 pm cdt, a severe thunderstorm capable of producing a tornado was located 8 miles southwest of beulah, moving east at 20 mph (radar indicated rotation). Hazards include tornado and ping pong ball size hail. Flying debris will be dangerous to those caught without shelter. mobile homes will be damaged or destroyed. damage to roofs, windows, and vehicles will occur. Tree damage is likely. 5/27/2018 4:01 AM CDT At 342 am cdt, severe thunderstorms were located along a line extending from 5 miles northeast of burlington to near benedict to 8 miles southeast of stanton, moving east at 45 mph (radar indicated). Hazards include 70 mph wind gusts and nickel size hail. Expect considerable tree damage. damage is likely to mobile homes, roofs, and outbuildings. these severe storms will be near, deering around 400 am cdt. butte around 405 am cdt. Other locations impacted by these severe thunderstorms include logan, wolseth, bergen, strawberry lake, falkirk, norwich, voltaire, ruso and simcoe. 5/27/2018 3:43 AM CDT At 327 am cdt, severe thunderstorms were located along a line extending from foxholm to near max to 6 miles southwest of stanton, moving east at 30 mph (radar indicated). Hazards include 70 mph wind gusts and nickel size hail. Expect considerable tree damage. damage is likely to mobile homes, roofs, and outbuildings. 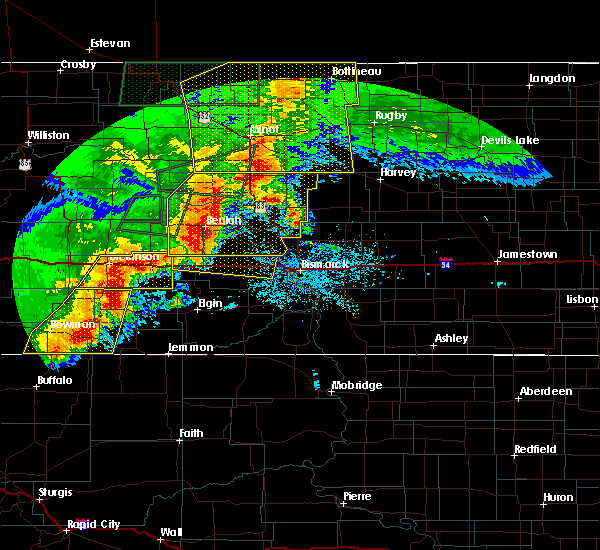 severe thunderstorms will be near, max around 335 am cdt. burlington around 340 am cdt. 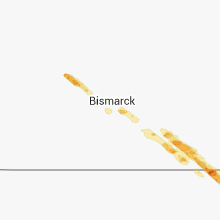 minot air force base and benedict around 355 am cdt. 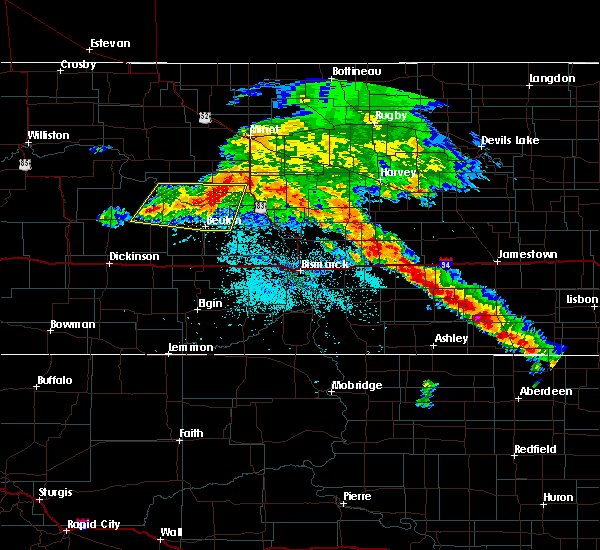 washburn around 410 am cdt. deering around 420 am cdt. butte around 430 am cdt. Other locations impacted by these severe thunderstorms include logan, wolseth, bergen, strawberry lake, falkirk, norwich, voltaire, ruso and simcoe. 5/27/2018 3:28 AM CDT At 327 am cdt, severe thunderstorms were located along a line extending from foxholm to near max to 6 miles southwest of stanton, moving east at 30 mph (radar indicated). Hazards include 70 mph wind gusts and nickel size hail. Expect considerable tree damage. damage is likely to mobile homes, roofs, and outbuildings. 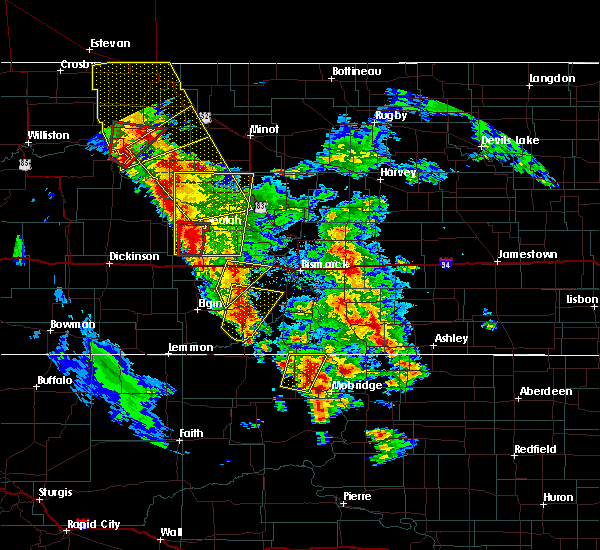 severe thunderstorms will be near, max around 335 am cdt. burlington around 340 am cdt. 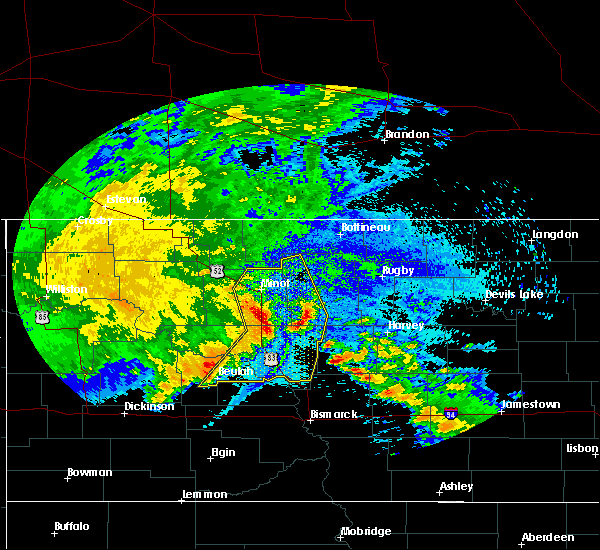 minot air force base and benedict around 355 am cdt. 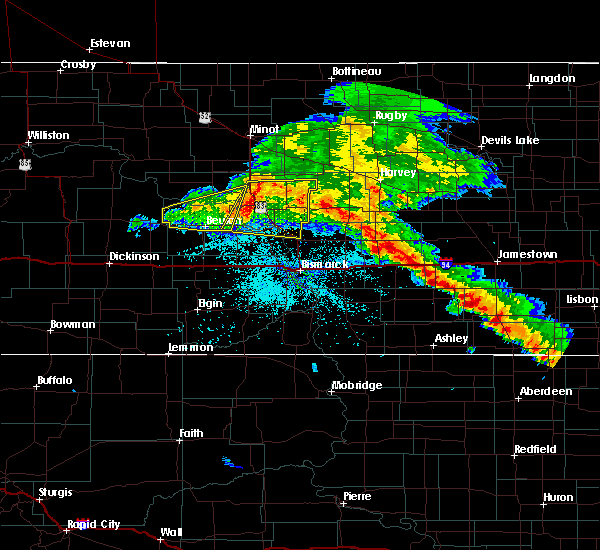 washburn around 410 am cdt. deering around 420 am cdt. butte around 430 am cdt. Other locations impacted by these severe thunderstorms include logan, wolseth, bergen, strawberry lake, falkirk, norwich, voltaire, ruso and simcoe. 8/12/2017 3:59 PM MDT At 458 pm cdt, a severe thunderstorm was located near golden valley, or 11 miles west of beulah, moving west at 15 mph (radar indicated). Hazards include 60 mph wind gusts and quarter size hail. Hail damage to vehicles is expected. expect wind damage to roofs, siding, and trees. This severe storm will be near, golden valley around 510 pm cdt. 8/12/2017 3:34 PM MDT At 433 pm cdt, a severe thunderstorm was located over zap, or 6 miles west of beulah, moving west at 15 mph (radar indicated). Hazards include 60 mph wind gusts and half dollar size hail. Hail damage to vehicles is expected. expect wind damage to roofs, siding, and trees. This severe thunderstorm will be near, golden valley around 500 pm cdt. 7/20/2017 6:13 PM CDT At 612 pm cdt/512 pm mdt/, severe thunderstorms were located along a line extending from 6 miles northwest of beulah bay recreation area to 7 miles northwest of hazen to 10 miles south of beulah to 5 miles northwest of hebron, moving southeast at 45 mph (radar indicated). Hazards include 70 mph wind gusts and quarter size hail. Hail damage to vehicles is expected. expect considerable tree damage. wind damage is also likely to mobile homes, roofs, and outbuildings. 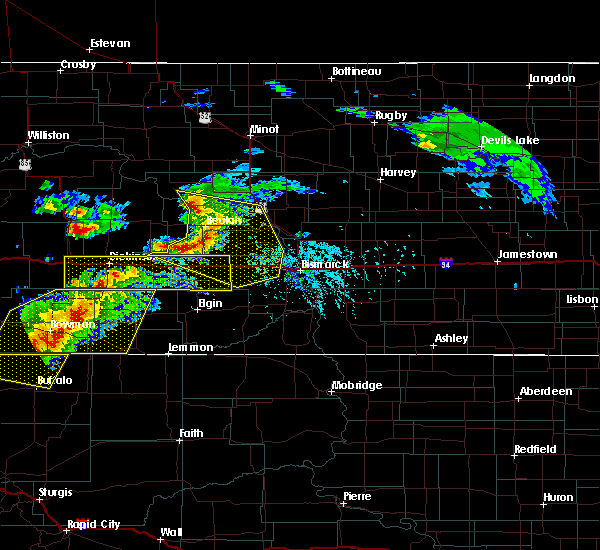 severe thunderstorms will be near, hazen around 620 pm cdt. stanton around 630 pm cdt. 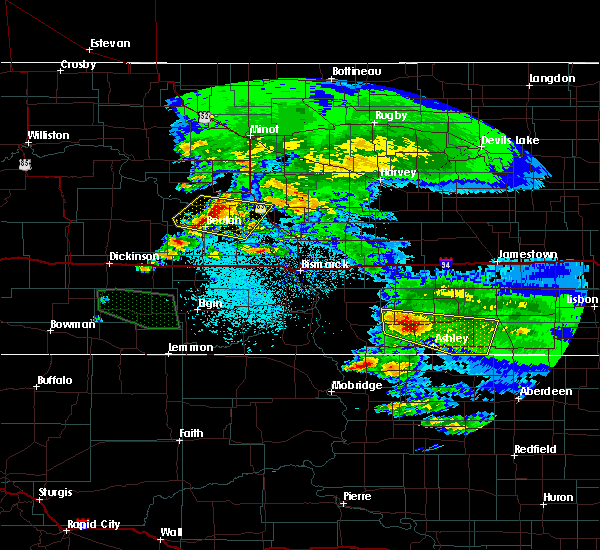 glen ullin, pick city and lake sakakawea state park around 635 pm cdt. new salem and riverdale around 640 pm cdt. 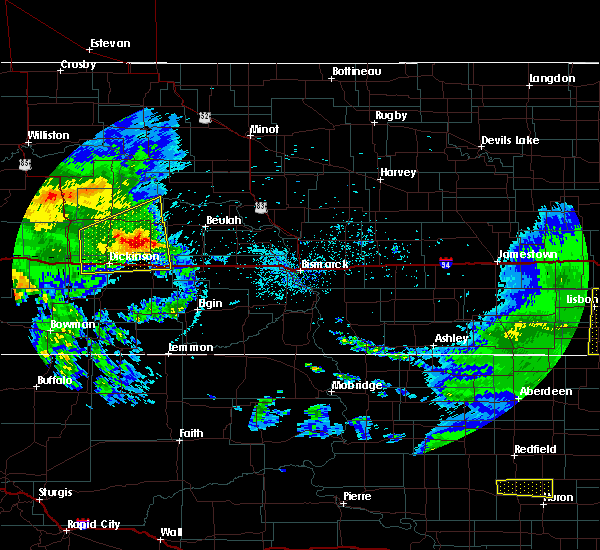 center around 645 pm cdt. almont around 655 pm cdt. 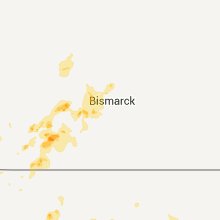 Other locations impacted by these severe thunderstorms include sweet briar lake, crown butte lake, hensler, dakota waters recreation area, fort clark, judson and nelson lake. 7/20/2017 5:44 PM CDT At 542 pm cdt/442 pm mdt/, a line of severe thunderstorms extended from dodge and halliday northward to deep water creek recreation area, moving southeast at 35 mph (radar indicated). Hazards include 70 mph wind gusts and half dollar size hail. Hail damage to vehicles is expected. expect considerable tree damage. wind damage is also likely to mobile homes, roofs, and outbuildings. Locations impacted include, beulah, zap, halliday, golden valley, dodge, roseglen, indian hills recreation area, mckenzie bay recreation area, beulah bay recreation area, deep water creek recreation area, white shield, twin buttes, dakota waters recreation area and raub. 7/20/2017 5:17 PM CDT At 514 pm cdt/414 pm mdt/, a severe thunderstorm was located 8 miles northwest of halliday, or 13 miles east of killdeer, moving southeast at 35 mph. another severe thunderstorm was near skunk creek and mckenzie bay recreation areas, moving east at 35 mph (radar indicated). Hazards include 70 mph wind gusts and half dollar size hail. Hail damage to vehicles is expected. expect considerable tree damage. wind damage is also likely to mobile homes, roofs, and outbuildings. 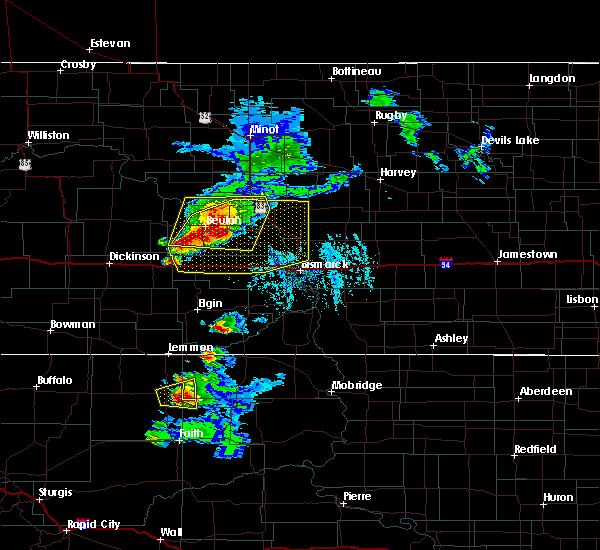 these severe thunderstorm will be near, halliday around 425 pm mdt. dodge around 540 pm cdt. golden valley around 550 pm cdt. zap around 600 pm cdt. beulah around 610 pm cdt. mckenzie bay recreation area around 520 pm cdt. Other locations impacted by this severe thunderstorm include deep water creek recreation area, dakota waters recreation area, raub, skunk creek bay recreation area, white shield and twin buttes. 7/14/2017 5:15 PM CDT At 515 pm cdt, severe thunderstorms were located along a line extending from 11 miles north of turtle lake to 5 miles northeast of stanton to near beulah, moving east at 40 mph (radar indicated). Hazards include 60 mph wind gusts and quarter size hail. Hail damage to vehicles is expected. expect wind damage to roofs, siding, and trees. 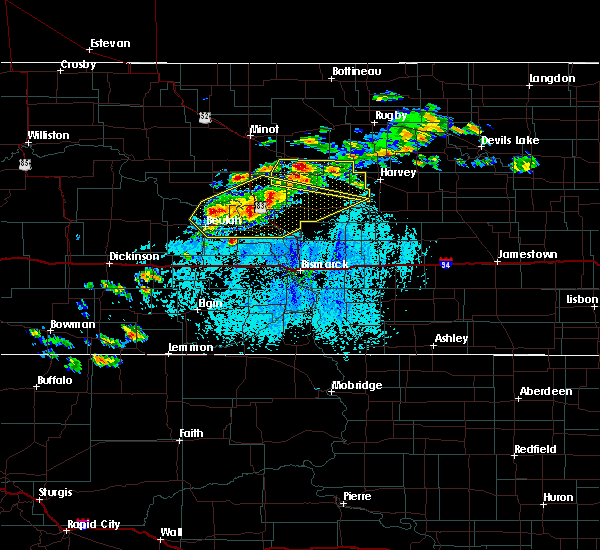 severe thunderstorms will be near, washburn around 535 pm cdt. cross ranch state park around 540 pm cdt. mcclusky around 550 pm cdt. Other locations impacted by these severe thunderstorms include hoffer lake, denhoff, falkirk, sanger, hensler, dakota waters recreation area and fort clark. 6/10/2017 3:39 AM CDT At 339 am cdt, severe thunderstorms were located along a line extending from 5 miles north of hazen to near center, moving northeast at 70 mph (public). Hazards include 70 mph wind gusts and penny size hail. Expect considerable tree damage. Damage is likely to mobile homes, roofs, and outbuildings. 7/10/2016 8:30 PM CDT At 828 pm cdt, severe thunderstorms were located along a line extending from 7 miles west of garrison to 4 miles east of fort stevenson state park to near underwood to 6 miles southwest of washburn, moving northeast at 55 mph (trained weather spotters). Hazards include 70 mph wind gusts and quarter size hail. Hail damage to vehicles is expected. expect considerable tree damage. wind damage is also likely to mobile homes, roofs, and outbuildings. 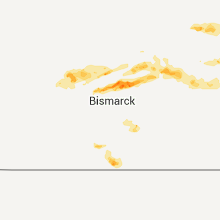 Locations impacted include, beulah, garrison, washburn, hazen, underwood, wilton, turtle lake, center, stanton, max, riverdale, pick city, mercer, coleharbor, lake sakakawea state park and hannover. 7/10/2016 8:13 PM CDT At 810 pm cdt, severe thunderstorms were located along a line extending from near beulah bay recreation area to 5 miles southeast of hazen bay recreation area to 5 miles south of stanton to near hannover, moving northeast at 55 mph (trained weather spotters). Hazards include 70 mph wind gusts and nickel size hail. Expect considerable tree damage. damage is likely to mobile homes, roofs, and outbuildings. 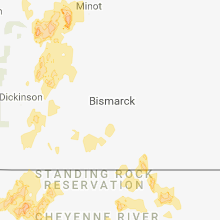 Locations impacted include, beulah, garrison, washburn, hazen, underwood, wilton, turtle lake, center, stanton, max, zap, riverdale, golden valley, coleharbor and lake sakakawea state park. 7/10/2016 7:55 PM CDT At 753 pm cdt, severe thunderstorms were located along a line extending from near golden valley to near beulah to 9 miles west of hannover to 10 miles northwest of new salem, moving northeast at 55 mph (radar indicated). Hazards include 60 mph wind gusts and quarter size hail. Hail damage to vehicles is expected. expect wind damage to roofs, siding, and trees. 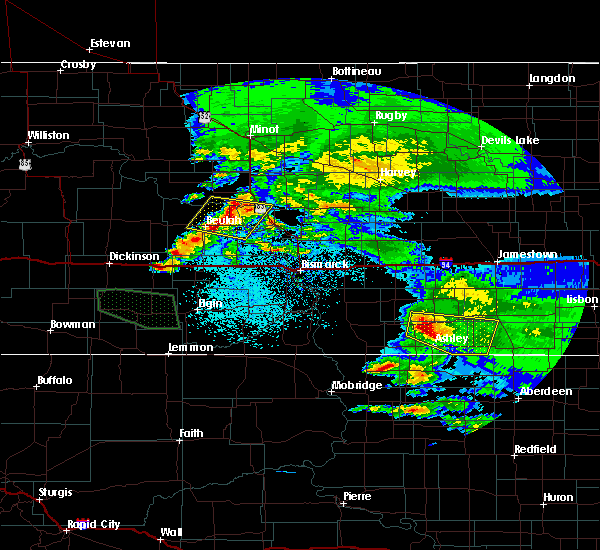 severe thunderstorms will be near, hazen around 800 pm cdt. hannover and hazen bay recreation area around 810 pm cdt. 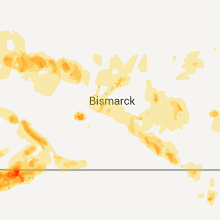 center, stanton and beulah bay recreation area around 815 pm cdt. riverdale, pick city and lake sakakawea state park around 820 pm cdt. fort stevenson state park around 825 pm cdt. underwood, coleharbor and cross ranch state park around 830 pm cdt. 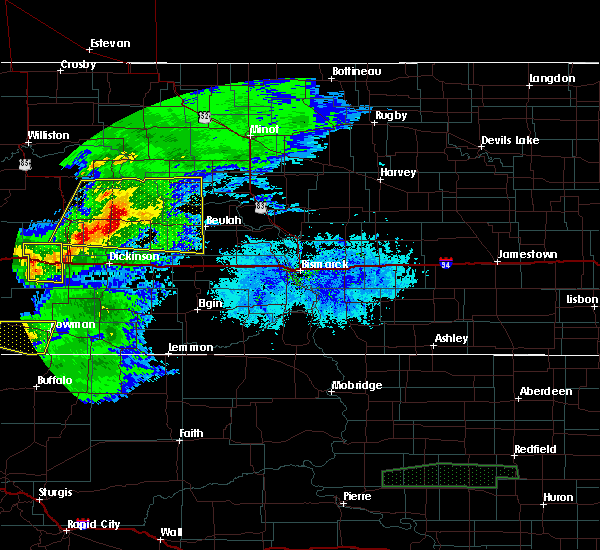 Garrison and washburn around 835 pm cdt. 7/10/2016 6:21 PM MDT At 719 pm cdt/619 pm mdt/, severe thunderstorms were located along a line extending from 4 miles west of marshall to 5 miles west of heart butte dam to 4 miles northeast of white butte, moving east at 70 mph. these are very dangerous storms. get to shelter now if you are in the warned area! stay away from windows! (public). Hazards include 80 mph wind gusts and golf ball size hail. Flying debris will be dangerous to those caught without shelter. mobile homes will be heavily damaged. expect considerable damage to roofs, windows, and vehicles. extensive tree damage and power outages are likely. Locations impacted include, glen ullin, elgin, hebron, richardton, carson, new leipzig, haynes, heart butte dam and fish creek dam. 7/10/2016 5:57 PM MDT At 656 pm cdt/556 pm mdt/, severe thunderstorms were located along a line extending from 7 miles south of dunn center to 13 miles south of hebron to 11 miles south of mott, moving east at 70 mph (radar indicated). Hazards include 70 mph wind gusts and half dollar size hail. Hail damage to vehicles is expected. expect considerable tree damage. wind damage is also likely to mobile homes, roofs, and outbuildings. 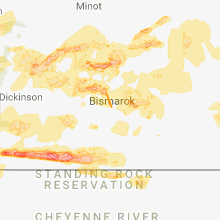 Locations impacted include, dickinson, beulah, hettinger, glen ullin, mott, elgin, new salem, hebron, new england, richardton, carson, gladstone, zap, new leipzig, regent, taylor, almont, marshall, haynes and heart butte dam. 7/10/2016 5:36 PM MDT At 635 pm cdt/535 pm mdt/, severe thunderstorms were located along a line extending from 5 miles east of south fairfield to 13 miles north of regent to 6 miles east of reeder, moving east at 70 mph (radar indicated). Hazards include two inch hail and 70 mph wind gusts. People and animals outdoors will be injured. expect hail damage to roofs, siding, windows, and vehicles. expect considerable tree damage. Wind damage is also likely to mobile homes, roofs, and outbuildings. 7/10/2016 1:38 AM MDT At 237 am cdt/137 am mdt/, a severe thunderstorm was located over hazen, or 8 miles east of beulah, moving northeast at 50 mph. this is a very dangerous storm (radar indicated). Hazards include 80 mph wind gusts and penny size hail. Flying debris will be dangerous to those caught without shelter. mobile homes will be heavily damaged. expect considerable damage to roofs, windows, and vehicles. extensive tree damage and power outages are likely. 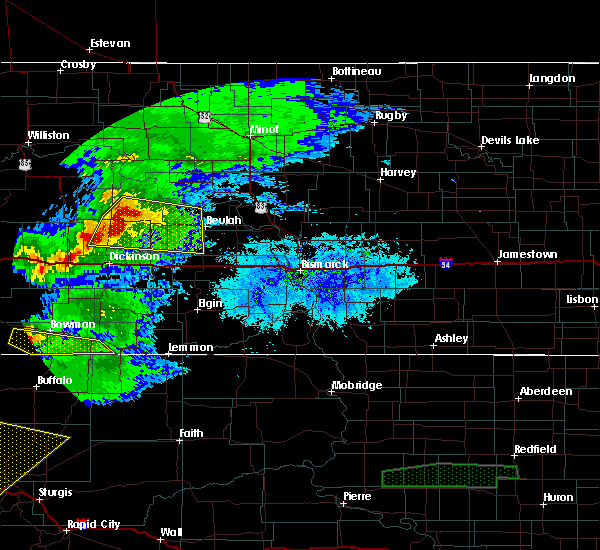 this severe storm will be near, stanton around 245 am cdt. Other locations impacted by this severe thunderstorm include fort clark, dakota waters recreation area and twin buttes. 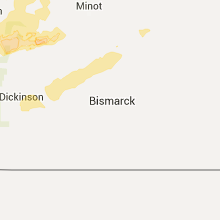 7/10/2016 1:17 AM MDT At 214 am cdt/114 am mdt/, a severe thunderstorm was located 5 miles south of zap, or 6 miles southwest of beulah, moving east at 40 mph. this is a very dangerous storm (radar indicated). Hazards include 80 mph wind gusts and penny size hail. Flying debris will be dangerous to those caught without shelter. mobile homes will be heavily damaged. expect considerable damage to roofs, windows, and vehicles. extensive tree damage and power outages are likely. this severe storm will be near, beulah around 225 am cdt. 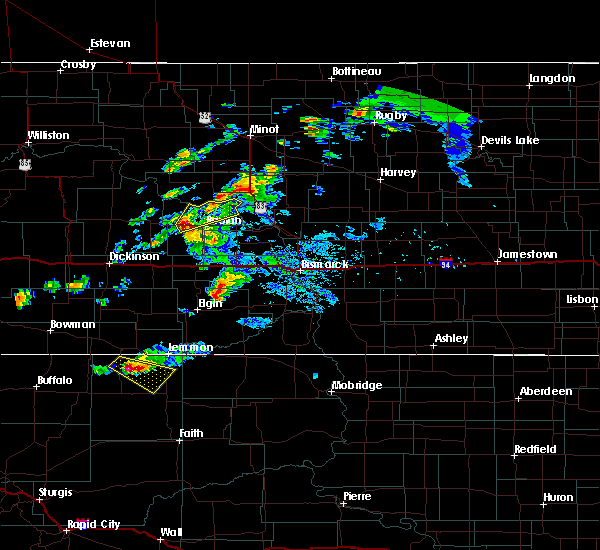 hazen around 235 am cdt. stanton around 245 am cdt. 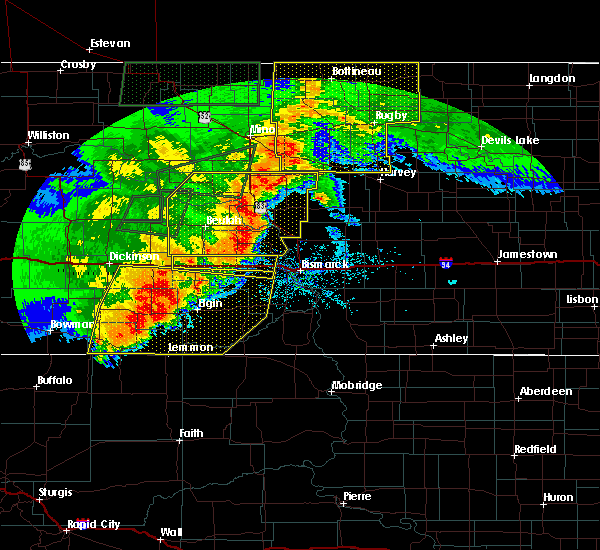 strong gust front winds of 50 to 60 mph extend well south of this storm, into morton county and along interstate 94. Other locations impacted by this severe thunderstorm include sweet briar lake, fort clark, judson, dakota waters recreation area, nelson lake and twin buttes. 7/10/2016 1:05 AM MDT At 201 am cdt/101 am mdt/, severe thunderstorms were located along a line extending from near indian hills recreation area to 9 miles south of beulah to near almont, moving east at 55 mph. these are very dangerous storms (radar indicated). Hazards include 80 mph wind gusts and penny size hail. Flying debris will be dangerous to those caught without shelter. mobile homes will be heavily damaged. expect considerable damage to roofs, windows, and vehicles. extensive tree damage and power outages are likely. 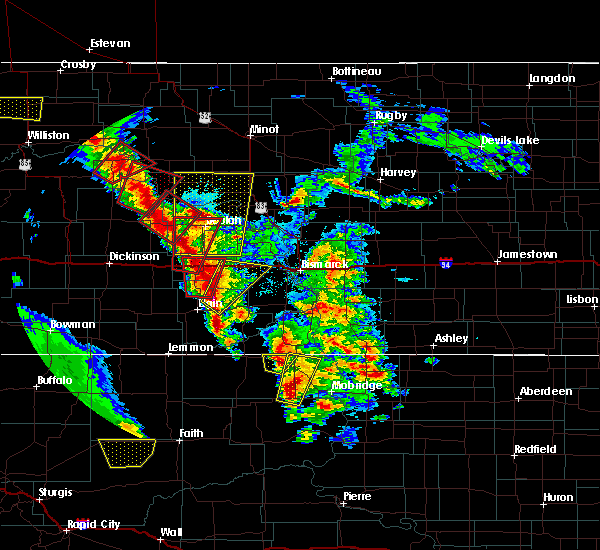 these severe storms will be near, almont around 205 am cdt. fish creek dam, hannover and beulah bay recreation area around 220 am cdt. beulah, center and hazen bay recreation area around 225 am cdt. 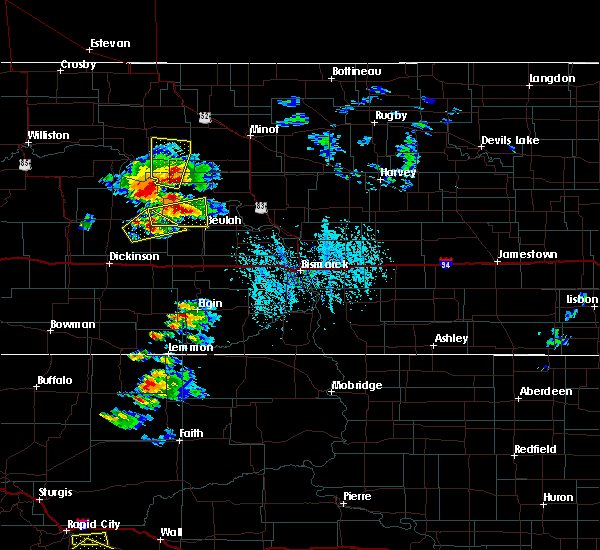 hazen around 230 am cdt. 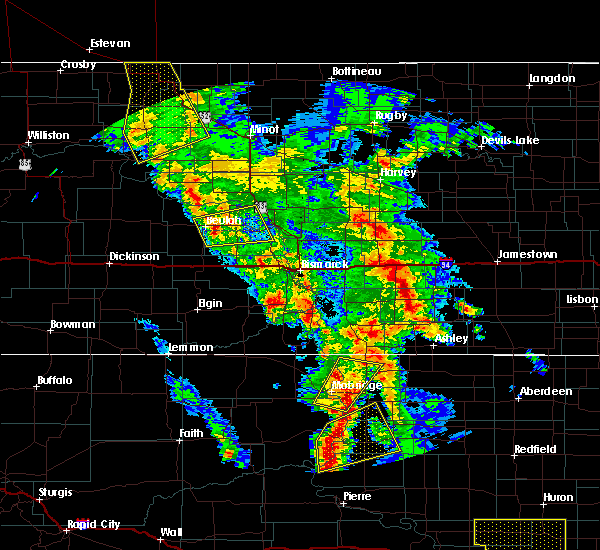 pick city and lake sakakawea state park around 235 am cdt. Other locations impacted by these severe thunderstorms include sweet briar lake, fort clark, judson, dakota waters recreation area, nelson lake and twin buttes. 7/10/2016 12:47 AM MDT At 146 am cdt/1246 am mdt/, severe thunderstorms were located along a line extending from 7 miles southwest of indian hills recreation area to 12 miles north of hebron to 5 miles west of glen ullin, moving northeast at 55 mph. these are very dangerous storms (radar indicated). Hazards include 80 mph wind gusts. Flying debris will be dangerous to those caught without shelter. mobile homes will be heavily damaged. expect considerable damage to roofs, windows, and vehicles. extensive tree damage and power outages are likely. 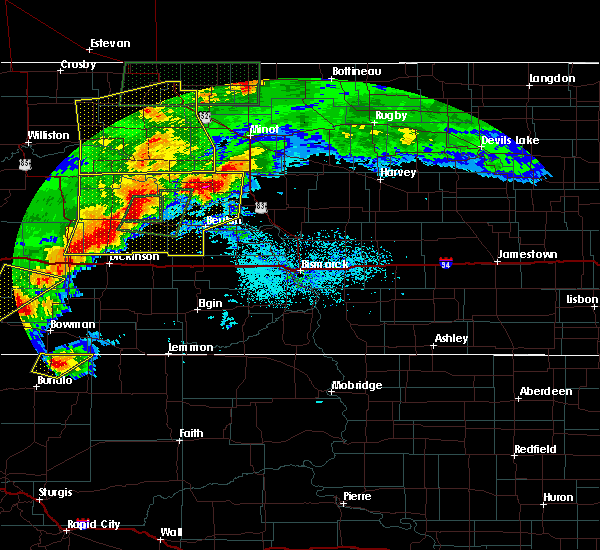 severe thunderstorms will be near, hazen around 210 am cdt. 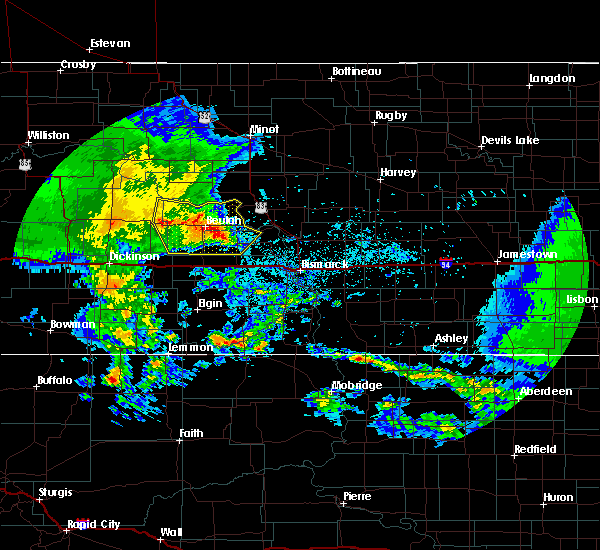 new salem around 215 am cdt. stanton around 220 am cdt. Other locations impacted by these severe thunderstorms include sweet briar lake, fort clark, judson, dakota waters recreation area, and twin buttes. 7/3/2016 7:07 PM CDT At 707 pm cdt, severe thunderstorms were located along a line extending from 6 miles northeast of stanton to 9 miles southwest of hannover to 4 miles southeast of hebron, moving southeast at 20 mph (public. 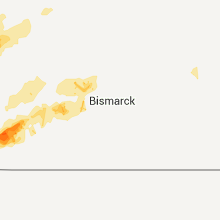 between 635 pm cdt and 650 pm cdt...hail up to golf ball size was reported in beulah, and wind gusts up to 72 mph were measured near hazen. numerous tree branches were reported down in hazen). Hazards include golf ball size hail and 70 mph wind gusts. People and animals outdoors will be injured. expect hail damage to roofs, siding, windows, and vehicles. expect considerable tree damage. wind damage is also likely to mobile homes, roofs, and outbuildings. these severe storms will be near, glen ullin around 725 pm cdt. 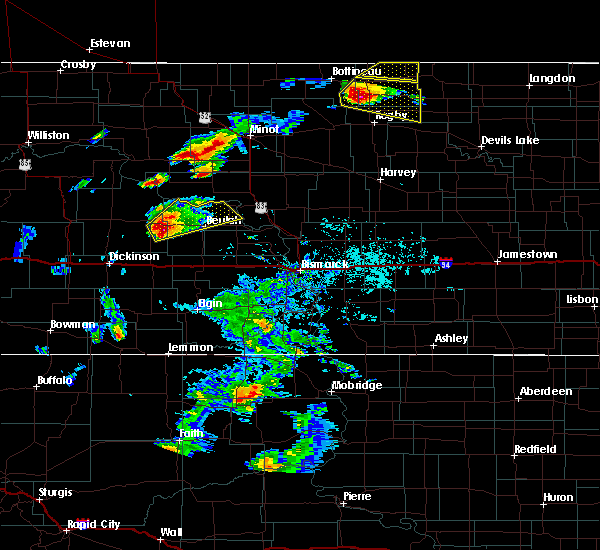 washburn around 735 pm cdt. new salem around 740 pm cdt. cross ranch state park around 745 pm cdt. 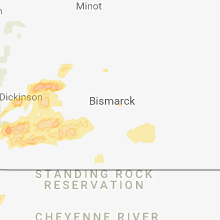 Other locations impacted by these severe thunderstorms include double ditch indian village, hensler, sweet briar lake, baldwin, fort clark, judson, nelson lake, crown butte lake, price and falkirk. 7/3/2016 6:44 PM CDT At 643 pm cdt, severe thunderstorms were located along a line extending from near riverdale to 8 miles south of hazen to 7 miles north of hebron, moving southeast at 25 mph (radar indicated). Hazards include golf ball size hail and 70 mph wind gusts. People and animals outdoors will be injured. expect hail damage to roofs, siding, windows, and vehicles. expect considerable tree damage. wind damage is also likely to mobile homes, roofs, and outbuildings. severe thunderstorms will be near, coleharbor around 700 pm cdt. hannover around 705 pm cdt. underwood around 715 pm cdt. glen ullin and center around 720 pm cdt. 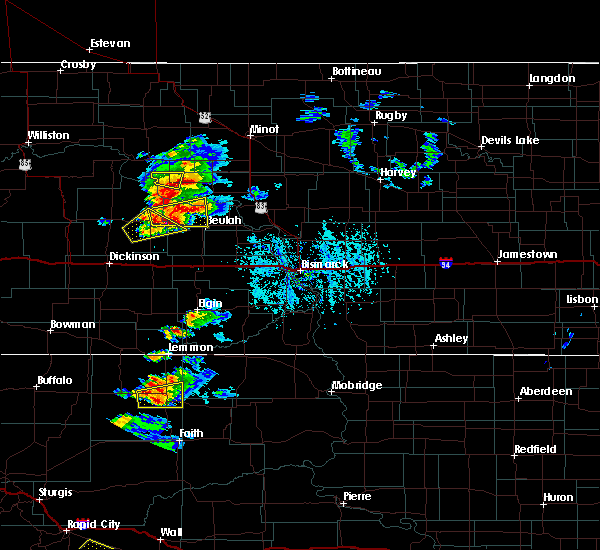 washburn around 740 pm cdt. new salem around 745 pm cdt. 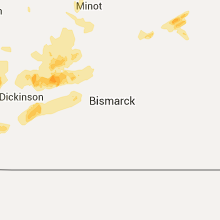 Other locations impacted by these severe thunderstorms include double ditch indian village, hensler, sweet briar lake, baldwin, fort clark, judson, nelson lake, crown butte lake, price and falkirk. 7/3/2016 5:36 PM MDT At 635 pm cdt, severe thunderstorms were located along a line extending from near hazen bay recreation area to near beulah to 13 miles south of zap, moving southeast at 20 mph (radar indicated. at 615 pm cdt...65 mph wind gusts were measured by a weather station near golden valley). Hazards include golf ball size hail and 60 mph wind gusts. People and animals outdoors will be injured. expect hail damage to roofs, siding, windows, and vehicles. expect wind damage to roofs, siding, and trees. 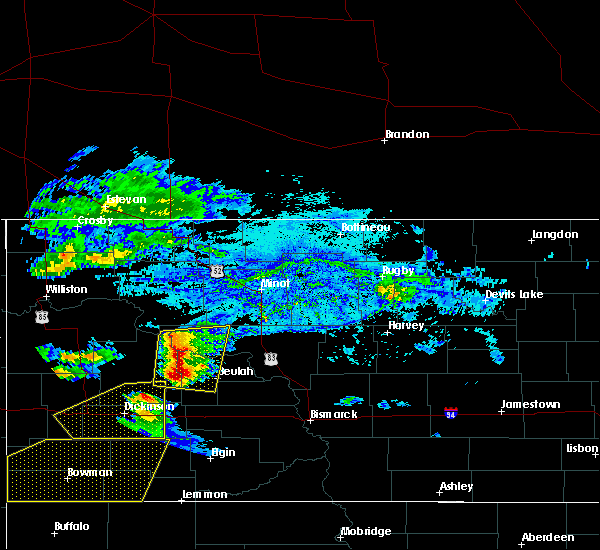 these severe storms will be near, hazen, pick city and lake sakakawea state park around 645 pm cdt. 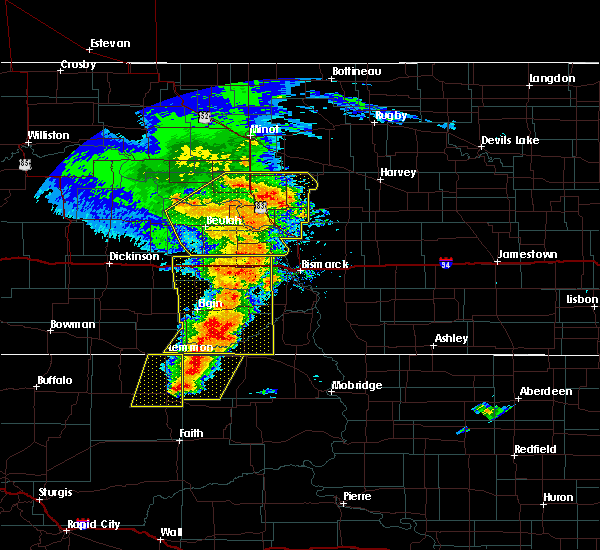 Other locations impacted by these severe thunderstorms include fort clark and dakota waters recreation area. 7/3/2016 5:35 PM MDT Golf Ball sized hail reported 0.6 miles NNE of Beulah, ND, hail lasted 15 minutes. largest was golf ball size. corrected for location. 7/3/2016 5:20 PM MDT At 619 pm cdt/519 pm mdt/, severe thunderstorms were located along a line extending from near roseglen to beulah bay recreation area to 8 miles south of golden valley, moving east at 15 mph (trained weather spotters. between 545 pm cdt and 555 pm cdt... golf ball size hail was reported 5 miles northeast of dodge). Hazards include golf ball size hail and 60 mph wind gusts. People and animals outdoors will be injured. expect hail damage to roofs, siding, windows, and vehicles. expect wind damage to roofs, siding, and trees. 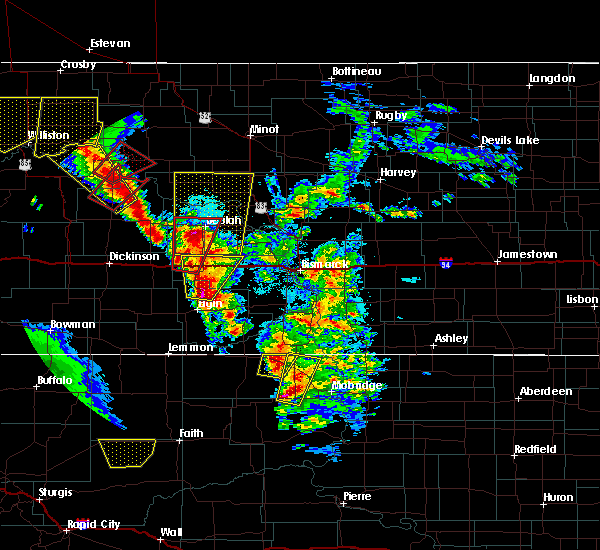 these severe storms will be near, beulah bay recreation area around 625 pm cdt. zap around 635 pm cdt. hazen bay recreation area around 640 pm cdt. 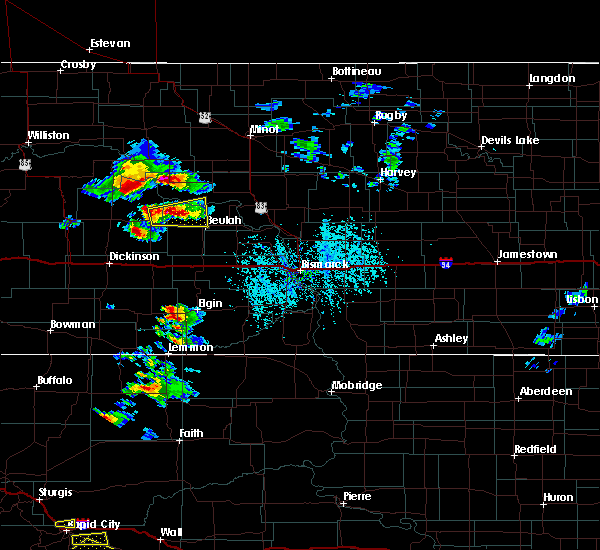 pick city and lake sakakawea state park around 645 pm cdt. Other locations impacted by these severe thunderstorms include emmet, white shield, fort clark and dakota waters recreation area. 7/3/2016 5:01 PM MDT At 600 pm cdt/500 pm mdt/, severe thunderstorms were located along a line extending from 4 miles northwest of roseglen to near beulah bay recreation area to 5 miles southwest of golden valley, moving east at 15 mph (trained weather spotters. 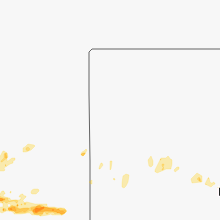 between 545 pm cdt and 555 pm cdt... golf ball size hail was reported 5 miles northeast of dodge). Hazards include golf ball size hail and 60 mph wind gusts. People and animals outdoors will be injured. expect hail damage to roofs, siding, windows, and vehicles. expect wind damage to roofs, siding, and trees. these severe storms will be near, roseglen around 605 pm cdt. beulah bay recreation area around 610 pm cdt. zap and hazen bay recreation area around 635 pm cdt. beulah, pick city and lake sakakawea state park around 645 pm cdt. Other locations impacted by these severe thunderstorms include emmet, white shield, raub, fort clark, dakota waters recreation area and twin buttes. 7/3/2016 4:45 PM MDT At 545 pm cdt/445 pm mdt/, severe thunderstorms were located along a line extending from 6 miles northwest of roseglen to 6 miles west of beulah bay recreation area to 5 miles south of dodge, moving east at 15 mph (radar indicated). Hazards include 60 mph wind gusts and quarter size hail. Hail damage to vehicles is expected. expect wind damage to roofs, siding, and trees. severe thunderstorms will be near, roseglen around 605 pm cdt. beulah bay recreation area around 610 pm cdt. zap around 630 pm cdt. hazen bay recreation area around 635 pm cdt. beulah, pick city and lake sakakawea state park around 645 pm cdt. 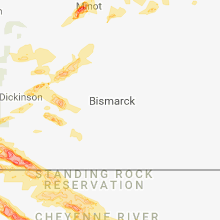 Other locations impacted by these severe thunderstorms include emmet, white shield, raub, fort clark, dakota waters recreation area and twin buttes. 7/3/2016 4:26 PM MDT At 525 pm cdt/425 pm mdt/, a severe thunderstorm was located 10 miles north of golden valley, or 17 miles northwest of beulah, moving east at 15 mph (radar indicated). Hazards include 60 mph wind gusts and quarter size hail. Hail damage to vehicles is expected. expect wind damage to roofs, siding, and trees. this severe storm will be near, beulah bay recreation area around 545 pm cdt. Other locations impacted by this severe thunderstorm include dakota waters recreation area. 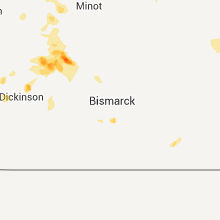 7/3/2016 4:05 PM MDT At 505 pm cdt/405 pm mdt/, a severe thunderstorm was located 8 miles north of dodge, or 20 miles northwest of beulah, moving east at 20 mph (radar indicated). Hazards include 60 mph wind gusts and quarter size hail. Hail damage to vehicles is expected. expect wind damage to roofs, siding, and trees. this severe storm will be near, beulah bay recreation area around 545 pm cdt. Other locations impacted by this severe thunderstorm include dakota waters recreation area. 7/3/2016 3:41 PM MDT At 441 pm cdt/341 pm mdt/, a severe thunderstorm was located 5 miles northeast of halliday, or 23 miles northwest of beulah, moving east at 15 mph (radar indicated). Hazards include 60 mph wind gusts and quarter size hail. Hail damage to vehicles is expected. expect wind damage to roofs, siding, and trees. 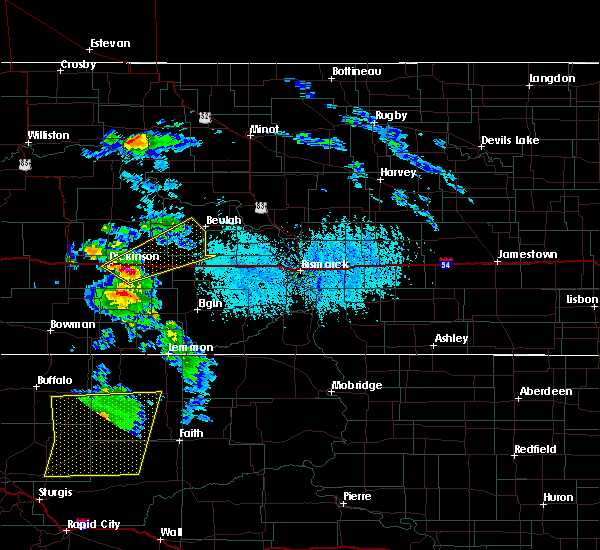 this severe thunderstorm will be near, dodge around 345 pm mdt. beulah bay recreation area around 545 pm cdt. Other locations impacted by this severe thunderstorm include dakota waters recreation area. 6/21/2016 10:41 PM MDT At 1140 pm cdt, a severe thunderstorm was located near hazen, or 10 miles northeast of beulah, moving east at 30 mph (radar indicated). Hazards include ping pong ball size hail and 60 mph wind gusts. People and animals outdoors will be injured. expect hail damage to roofs, siding, windows, and vehicles. expect wind damage to roofs, siding, and trees. This severe storm will be near, stanton around 1200 am cdt. 6/21/2016 10:29 PM MDT At 1128 pm cdt, a severe thunderstorm was located 6 miles northwest of hazen, or 7 miles north of beulah, moving east at 35 mph (radar indicated). Hazards include ping pong ball size hail and 60 mph wind gusts. People and animals outdoors will be injured. expect hail damage to roofs, siding, windows, and vehicles. expect wind damage to roofs, siding, and trees. 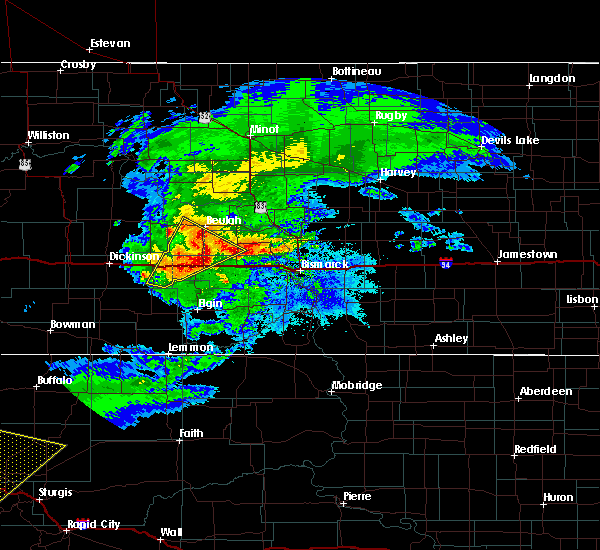 this severe storm will be near, hazen around 1140 pm cdt. stanton around 1200 am cdt. Other locations impacted by this severe thunderstorm include dakota waters recreation area. 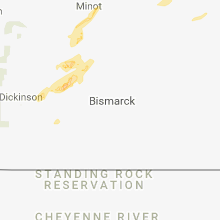 6/21/2016 10:16 PM MDT At 1116 pm cdt, a severe thunderstorm was located 8 miles north of zap, or 11 miles northwest of beulah, moving east at 35 mph (radar indicated). Hazards include ping pong ball size hail and 60 mph wind gusts. People and animals outdoors will be injured. expect hail damage to roofs, siding, windows, and vehicles. expect wind damage to roofs, siding, and trees. this severe thunderstorm will be near, beulah bay recreation area around 1125 pm cdt. 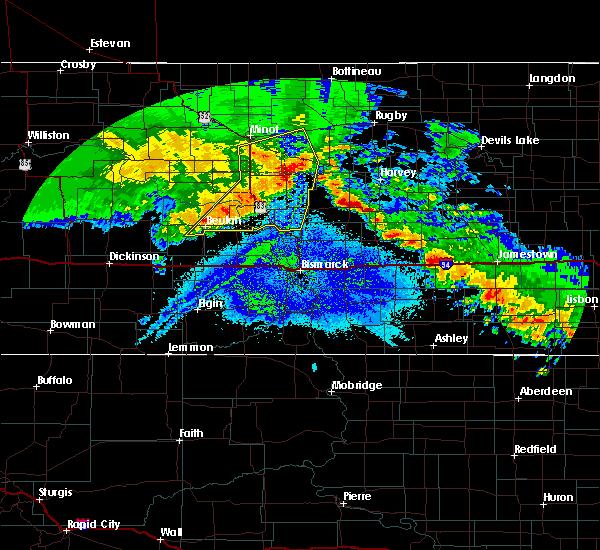 beulah around 1130 pm cdt. hazen around 1140 pm cdt. stanton around 1200 am cdt. Other locations impacted by this severe thunderstorm include dakota waters recreation area. 6/2/2016 4:04 PM MDT At 503 pm cdt/403 pm mdt/, a severe thunderstorm was located near gladstone, or 13 miles east of dickinson, moving northeast at 40 mph (radar indicated). Hazards include 60 mph wind gusts and quarter size hail. Hail damage to vehicles is expected. expect wind damage to roofs, siding, and trees. 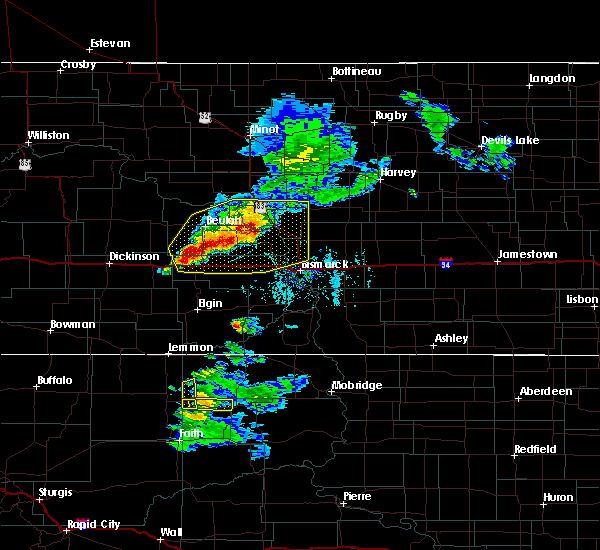 this severe thunderstorm will be near, taylor around 415 pm mdt. Richardton around 420 pm mdt. 9/6/2015 12:22 AM MDT At 121 am cdt, severe thunderstorms were located along a line extending from zap to 4 miles northwest of glen ullin, moving northeast at 50 mph (radar indicated). Hazards include 60 mph wind gusts and quarter size hail. Hail damage to vehicles is expected. expect wind damage to roofs, siding and trees. Locations impacted include, beulah, glen ullin, hazen, new salem, hebron, zap, golden valley, hannover and sweet briar lake. 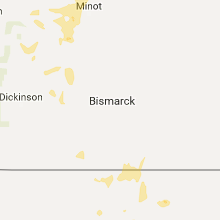 9/6/2015 12:51 AM CDT At 1250 am cdt /1150 pm mdt/, severe thunderstorms were located along a line extending from 5 miles south of marshall to 15 miles south of richardton, moving northeast at 50 mph (radar indicated). Hazards include 60 mph wind gusts and quarter size hail. Hail damage to vehicles is expected. Expect wind damage to roofs, siding and trees. 6/24/2015 8:31 PM MDT At 930 pm cdt, a severe thunderstorm was located 3 miles southwest of hazen, or 6 miles east of beulah, moving east at 15 mph (radar indicated). Hazards include 60 mph wind gusts and quarter size hail. Hail damage to vehicles is expected. expect wind damage to roofs, siding and trees. 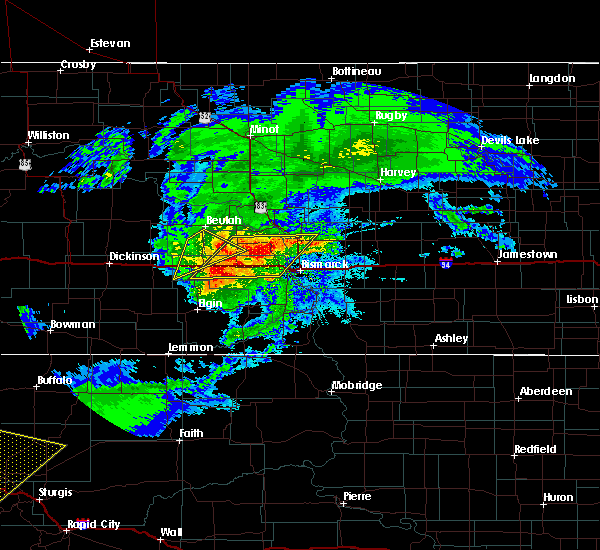 this severe storm will be near, hazen around 935 pm cdt. Dime to half dollar size hail has been reported with this storm near beulah. 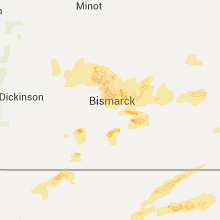 6/24/2015 8:22 PM MDT At 921 pm cdt, a severe thunderstorm was located 2 miles southeast of beulah, moving east at 20 mph (radar indicated). Hazards include 60 mph wind gusts and half dollar size hail. Hail damage to vehicles is expected. expect wind damage to roofs, siding and trees. 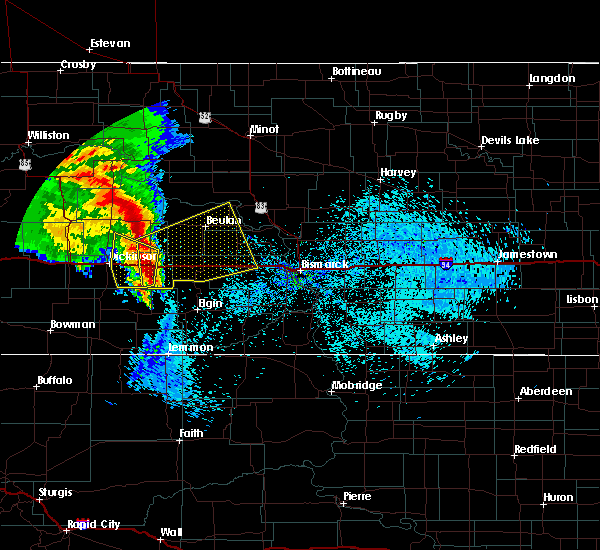 this severe storm will be near, hazen around 935 pm cdt. This storm has a history of producing half dollar size hail. 6/24/2015 8:14 PM MDT At 914 pm cdt, a severe thunderstorm was located over beulah, moving east at 15 mph (trained weather spotters. at half dollar size hail was reported in beulah). Hazards include 60 mph wind gusts and half dollar size hail. Hail damage to vehicles is expected. expect wind damage to roofs, siding and trees. 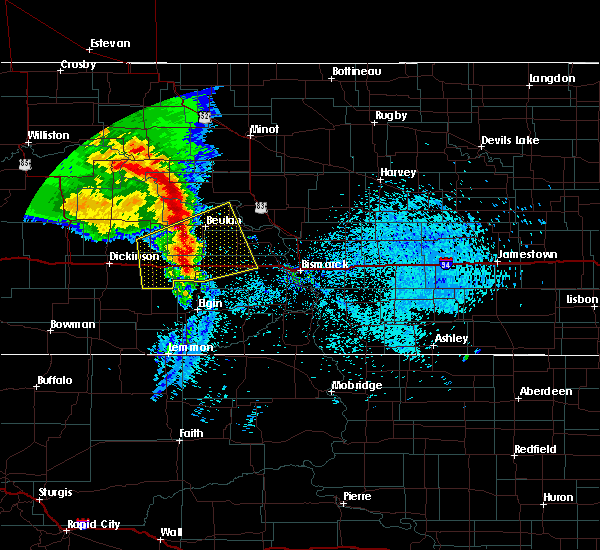 This severe storm will be near, hazen around 940 pm cdt. 6/24/2015 8:08 PM MDT Half Dollar sized hail reported 2 miles N of Beulah, ND, quarter to half dollar size hail 2 miles south of beulah. little wind with the hail. 6/24/2015 8:02 PM MDT At 902 pm cdt, a severe thunderstorm was located near beulah, moving east at 15 mph (radar indicated). Hazards include 60 mph wind gusts and quarter size hail. Hail damage to vehicles is expected. expect wind damage to roofs, siding and trees. 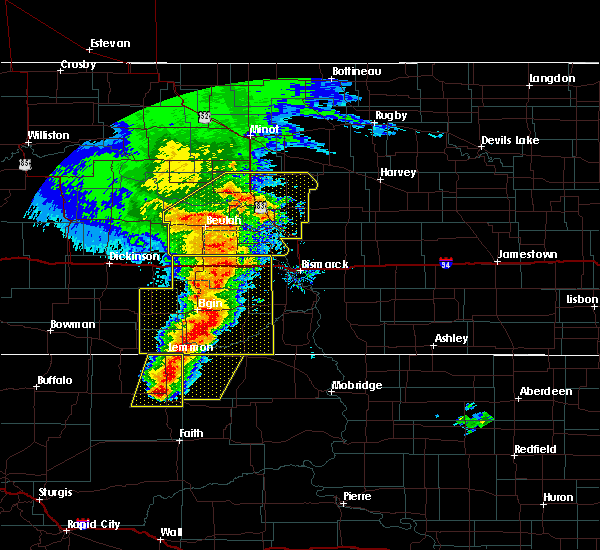 this severe thunderstorm will be near, beulah around 915 pm cdt. 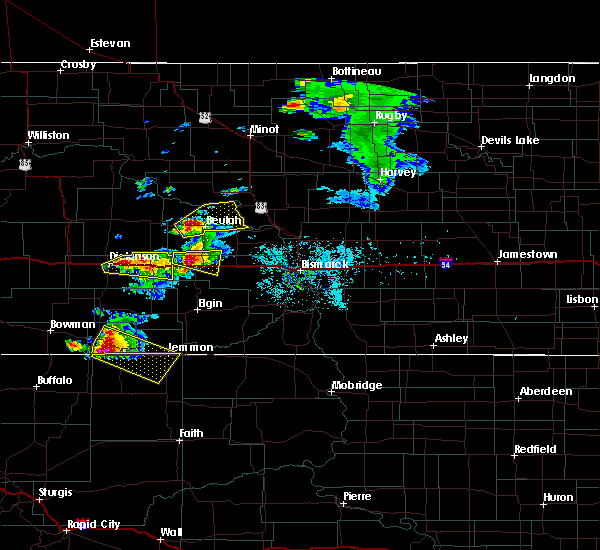 Hazen around 940 pm cdt. 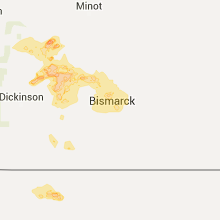 6/19/2015 7:29 PM MDT At 828 pm cdt, severe thunderstorms were located along a line extending from 9 miles south of nelson lake to 15 miles north of mott, moving southeast at 30 mph (radar indicated). Hazards include 70 mph wind gusts and quarter size hail. Hail damage to vehicles is expected. expect considerable tree damage. wind damage is also likely to mobile homes, roofs and outbuildings. Locations impacted include, beulah. 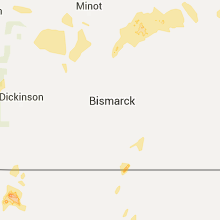 6/19/2015 8:18 PM CDT At 817 pm cdt /717 pm mdt/, severe thunderstorms were located along a line extending from 6 miles southwest of nelson lake to 15 miles south of richardton, moving southeast at 30 mph (radar indicated). Hazards include 70 mph wind gusts and quarter size hail. Hail damage to vehicles is expected. expect considerable tree damage. wind damage is also likely to mobile homes, roofs and outbuildings. Locations impacted include, beulah, glen ullin, hebron and zap. 6/19/2015 8:05 PM CDT At 803 pm cdt /703 pm mdt/, severe thunderstorms were located along a line extending from 4 miles southwest of center to 10 miles south of richardton, moving east at 115 mph. these are very dangerous storms with damaging wind (radar indicated). Hazards include 80 mph wind gusts and quarter size hail. Flying debris will be dangerous to those caught without shelter. mobile homes will be heavily damaged. expect considerable damage to roofs, windows and vehicles. extensive tree damage and power outages are likely. locations impacted include, beulah, glen ullin, hebron, richardton, zap, golden valley, taylor and dodge. Time, mot, loc 0103z 280deg 101kt 4707 10136 4673 10236. 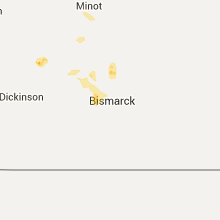 6/19/2015 6:51 PM MDT At 750 pm cdt /650 pm mdt/, severe thunderstorms were located along a line extending from 4 miles southwest of zap to 11 miles north of new england, moving southeast at 30 mph. these are very dangerous storms (radar indicated). Hazards include 80 mph wind gusts and quarter size hail. Flying debris will be dangerous to those caught without shelter. mobile homes will be heavily damaged. expect considerable damage to roofs, windows and vehicles. extensive tree damage and power outages are likely. These severe thunderstorms will remain over mainly rural areas of eastern stark, southeastern dunn, southwestern oliver, northwestern morton and southwestern mercer counties. 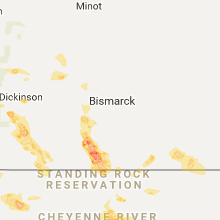 6/19/2015 6:38 PM MDT At 737 pm cdt /637 pm mdt/, severe thunderstorms were located along a line extending from golden valley to 8 miles southeast of south heart, moving southeast at 30 mph (radar indicated). Hazards include 60 mph wind gusts and half dollar size hail. Hail damage to vehicles is expected. expect wind damage to roofs, siding and trees. 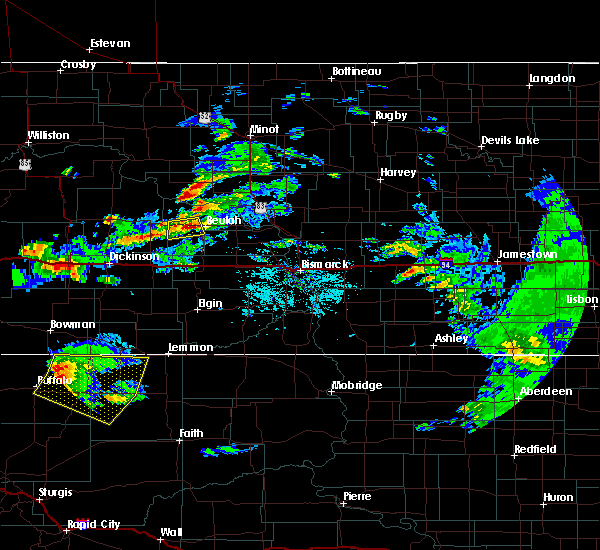 severe thunderstorms will be near, zap around 645 pm mdt. Other locations impacted by these severe thunderstorms include dickinson regional airport and hirschville. 6/19/2015 6:21 PM MDT At 719 pm cdt /619 pm mdt/, severe thunderstorms were located along a line extending from 11 miles north of indian hills recreation area to dunn center, moving east at 40 mph (radar indicated). Hazards include 60 mph wind gusts and quarter size hail. Hail damage to vehicles is expected. expect wind damage to roofs, siding and trees. these severe storms will be near, dodge around 740 pm cdt. golden valley around 745 pm cdt. Other locations impacted by these severe thunderstorms include twin buttes and hirschville. 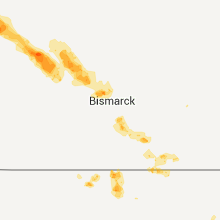 6/19/2015 6:02 PM MDT At 701 pm cdt /601 pm mdt/, severe thunderstorms were located along a line extending from 10 miles north of mckenzie bay recreation area to 5 miles southwest of killdeer, moving east at 50 mph (radar indicated). Hazards include 60 mph wind gusts and quarter size hail. Hail damage to vehicles is expected. expect wind damage to roofs, siding and trees. these severe storms will be near, roseglen around 725 pm cdt. 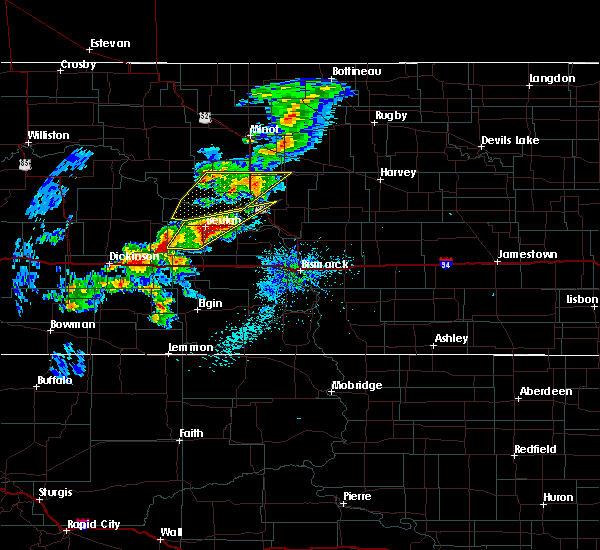 halliday around 730 pm cdt. dodge around 735 pm cdt. golden valley around 740 pm cdt. Other locations impacted by these severe thunderstorms include raub, hirschville, oakdale, white shield, deep water creek recreation area, dakota waters recreation area and twin buttes. 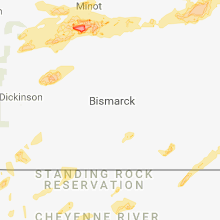 6/19/2015 6:41 PM CDT At 637 pm cdt /537 pm mdt/, severe thunderstorms were located along a line extending from mandaree to 8 miles south of grassy butte, moving east at 50 mph (radar indicated). Hazards include 60 mph wind gusts and half dollar size hail. Hail damage to vehicles is expected. expect wind damage to roofs, siding and trees. 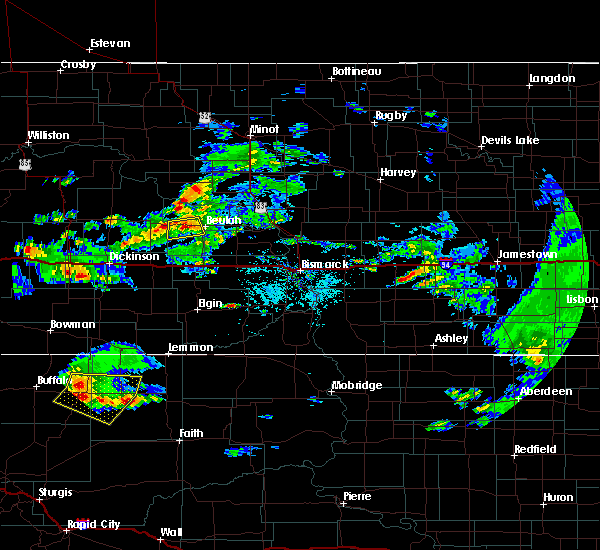 severe thunderstorms will be near, mandaree around 545 pm mdt. manning around 600 pm mdt. killdeer around 705 pm cdt. halliday and roseglen around 725 pm cdt. dodge around 735 pm cdt. golden valley around 740 pm cdt. zap around 745 pm cdt. Other locations impacted by these severe thunderstorms include raub, hirschville, oakdale, white shield, deep water creek recreation area, skunk creek bay recreation area, fairfield, dakota waters recreation area and twin buttes. 3/28/2015 7:43 PM CDT A severe thunderstorm warning remains in effect for central morton. oliver. eastern mercer. south central mclean and extreme northwestern grant counties until 800 pm cdt/700 pm mdt/. 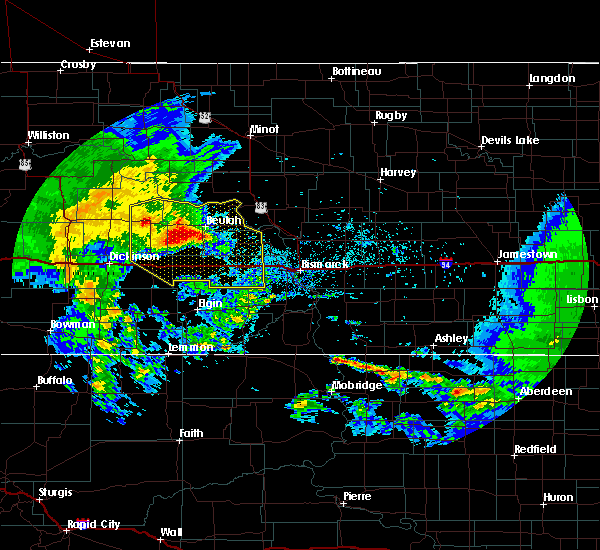 at 740 pm cdt. 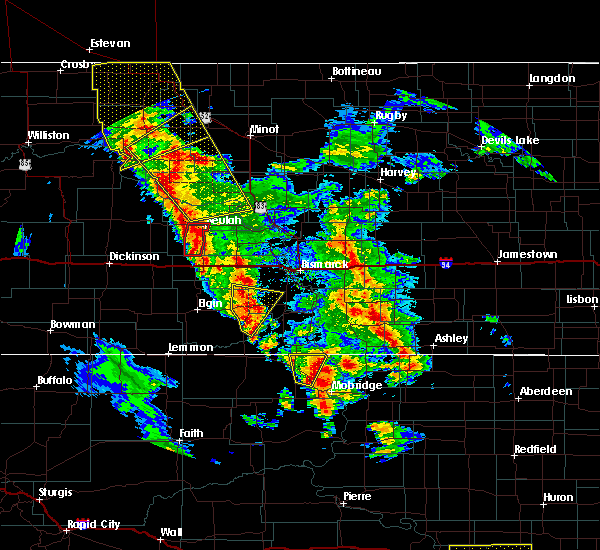 severe thunderstorms were located along a line extending from underwood to 8 miles southeast of almont. Moving east at 55 mph. 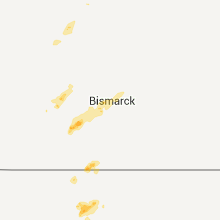 3/28/2015 7:14 PM CDT The national weather service in bismarck has issued a * severe thunderstorm warning for. 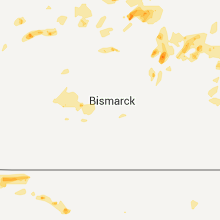 northwestern grant county in south central north dakota. south central mclean county in south central north dakota. eastern mercer county in south central north dakota. Northwestern morton county in south central north dakota. 3/28/2015 5:55 PM MDT A severe thunderstorm warning remains in effect for southeastern dunn. northwestern morton. 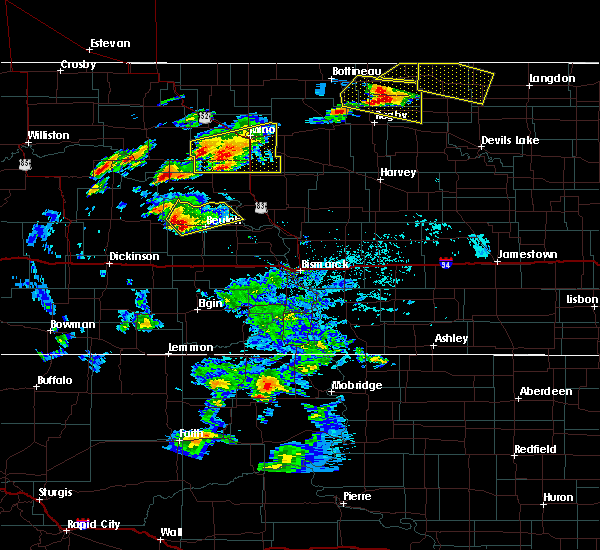 eastern stark and mercer counties until 730 pm cdt/630 pm mdt/. 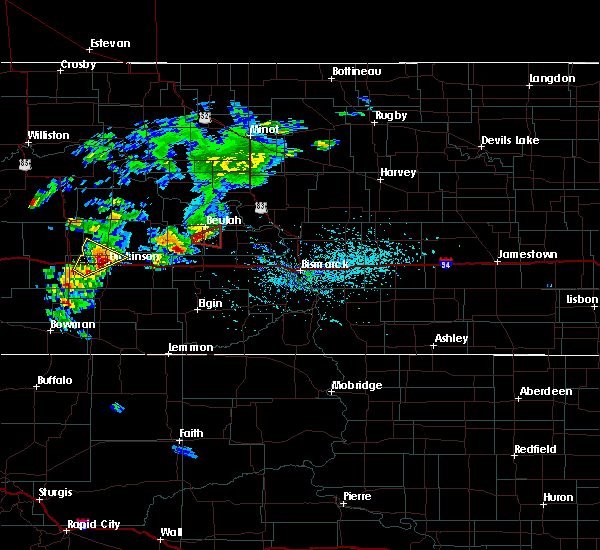 at 652 pm cdt/552 pm mdt/. severe thunderstorms were located along a line extending from 15 miles northeast of halliday to 6 miles northeast of lefor. Moving east at 50 mph. 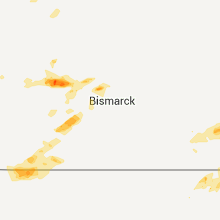 3/28/2015 5:41 PM MDT The national weather service in bismarck has issued a * severe thunderstorm warning for. 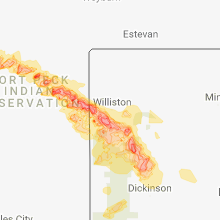 eastern dunn county in southwest north dakota. mercer county in south central north dakota. northwestern morton county in south central north dakota. Eastern stark county in southwest north dakota. 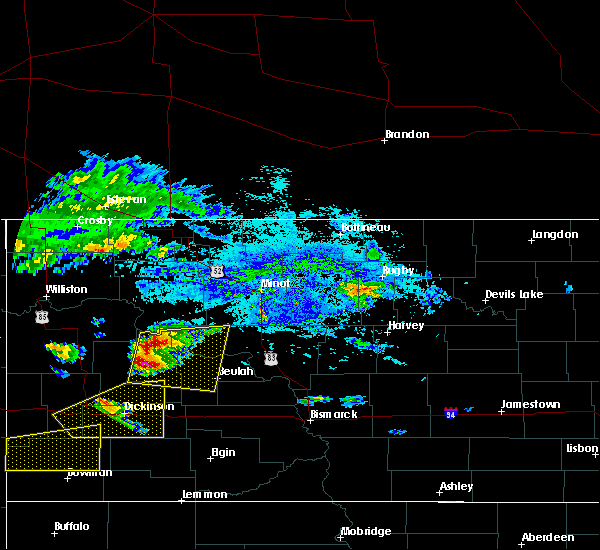 1/1/0001 12:00 AM Quarter sized hail reported 1.9 miles ESE of Beulah, ND, slightly larger than quarter sized hail. estimated wind speeds of 75-80 mph. 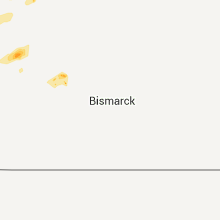 1/1/0001 12:00 AM Half Dollar sized hail reported 14.3 miles SSE of Beulah, ND, nd atmospheric resource board observer reports 1.25 inch hail with strong winds. 1/1/0001 12:00 AM Golf Ball sized hail reported 1.9 miles ESE of Beulah, ND, golfball hail and lots of ping pong ball sized hail. estimate 60 mph winds. lots of wind-driven hail crop damage. hail began 655 am and ended 710 am cdt.